I had the thought to put people in the car from Road Trip (thanks Krista, for that idea!) and wanted to use the phrase “Enjoy the journey.” And all of that led me to thinking this would make a great wedding card. 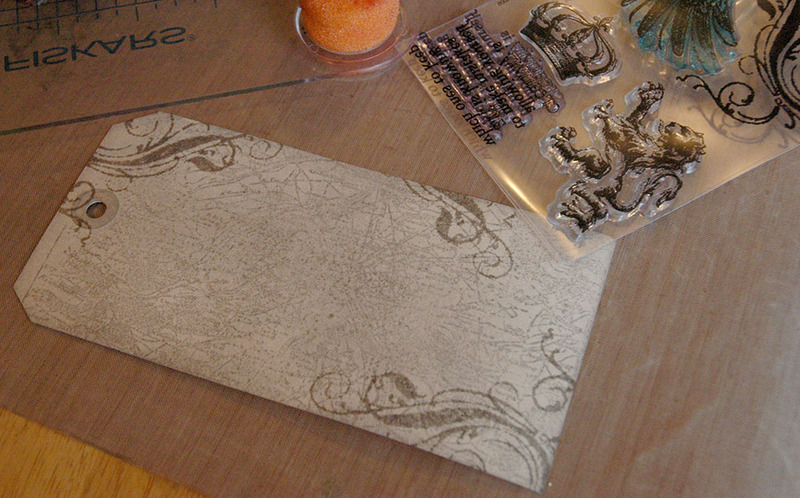 Start by inking up a background stamp with Pumice Stone Distress Ink and stamp onto a manilla tag. 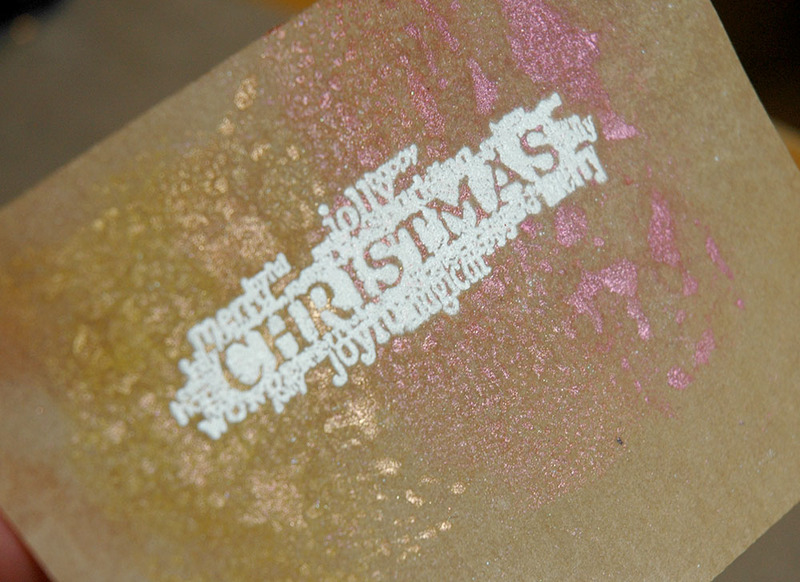 Then use the ink blending tool with the same colour to ink the edges and soften the stamped image by blending over it. 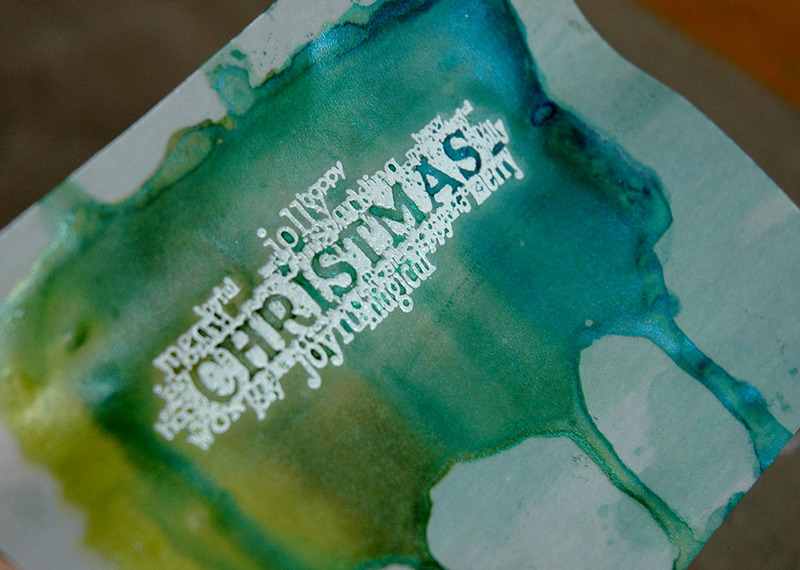 Now, stamp some flourished with the same ink. 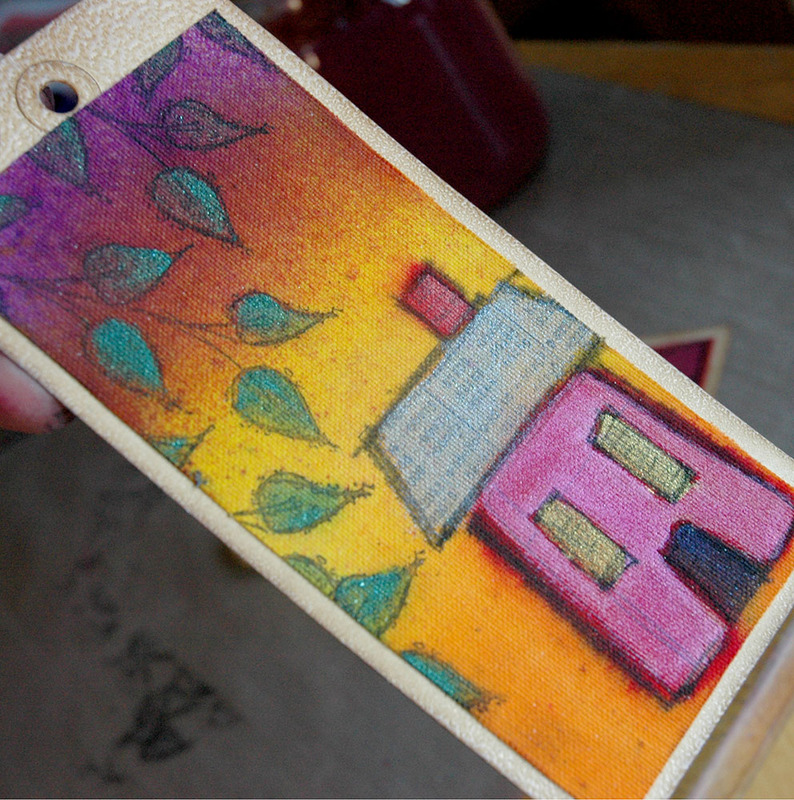 Because we’ve blended and soften the background colour, the new stamped image will show up well. 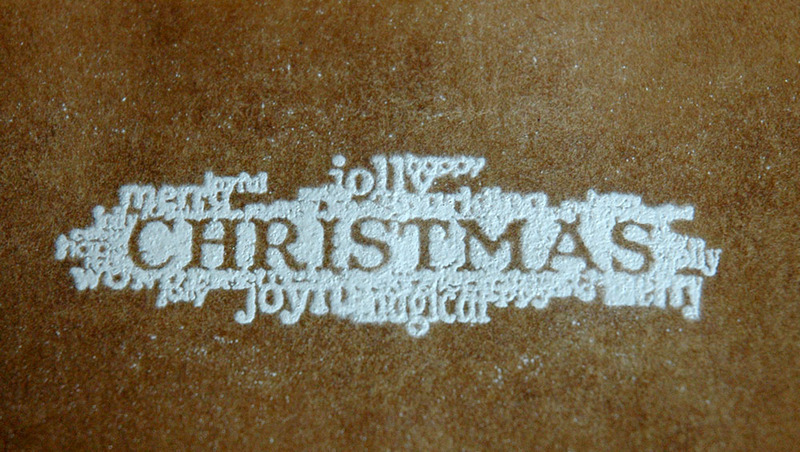 Set this aside to dry – we’ll be doing some heat embossing later and we don’t want the powder to stick to the entire tag. 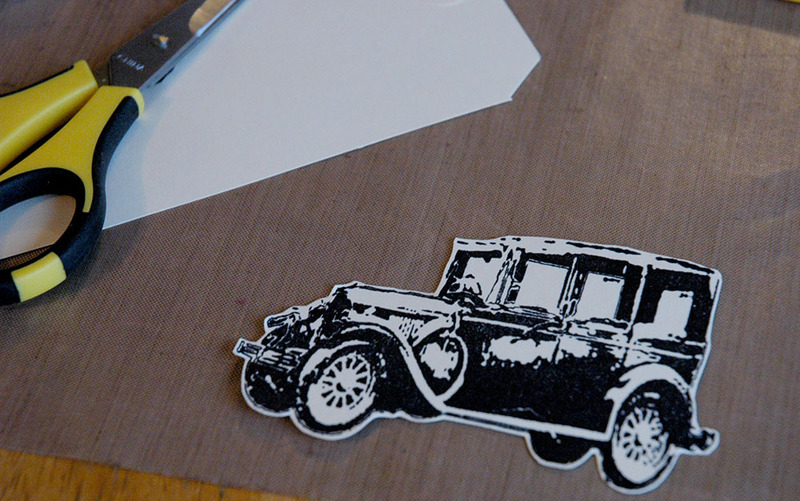 Ink up the car stamp with black Archival and stamp onto a spare manilla tag, then cut it out. 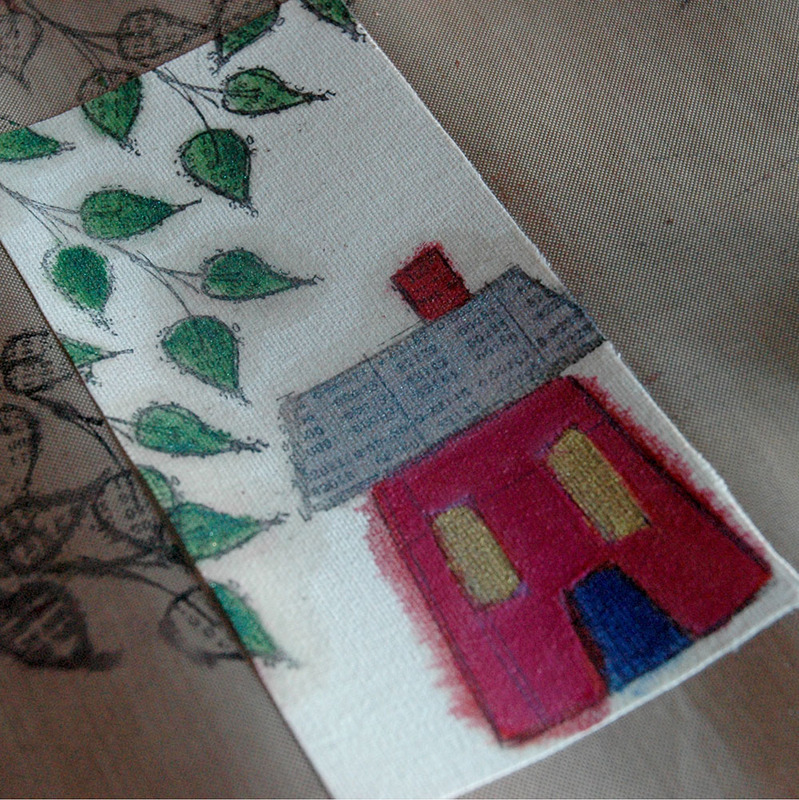 Using a craft knife and cutting mat, trim out the windows of the car, then use an ink blending tool to colour the edges with Gathered Twigs Distress Ink. 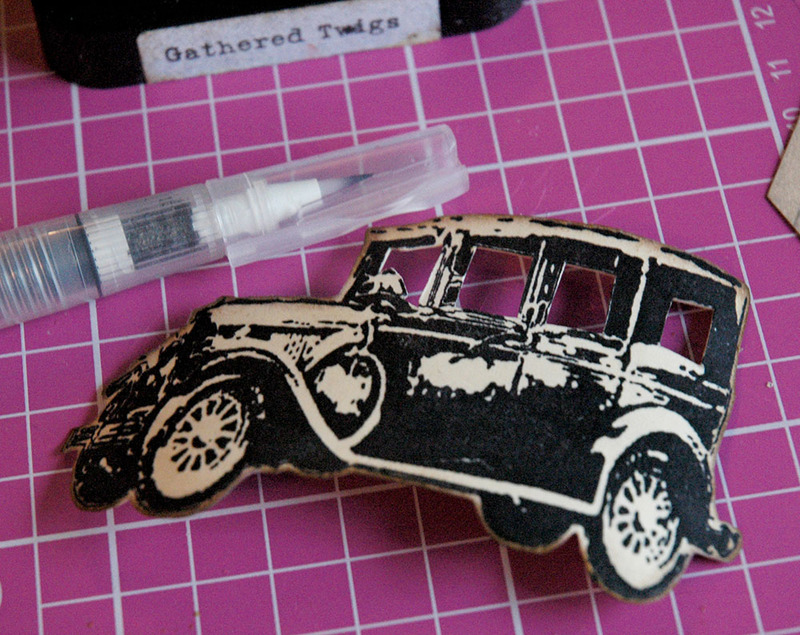 If you want, use the Ranger Fine Detail Nib Water Brush to pull the ink from the edges into the centre of the car. 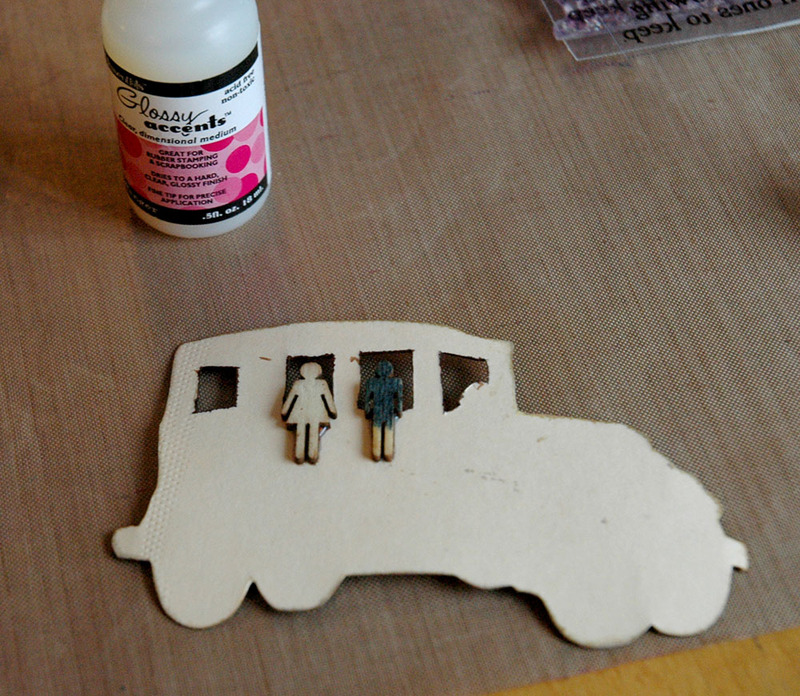 Now, use the Distress Markers in Broken China and Barn Door to colour two small wood veneer people (or whatever colours you want to go with the couple being hitched!). 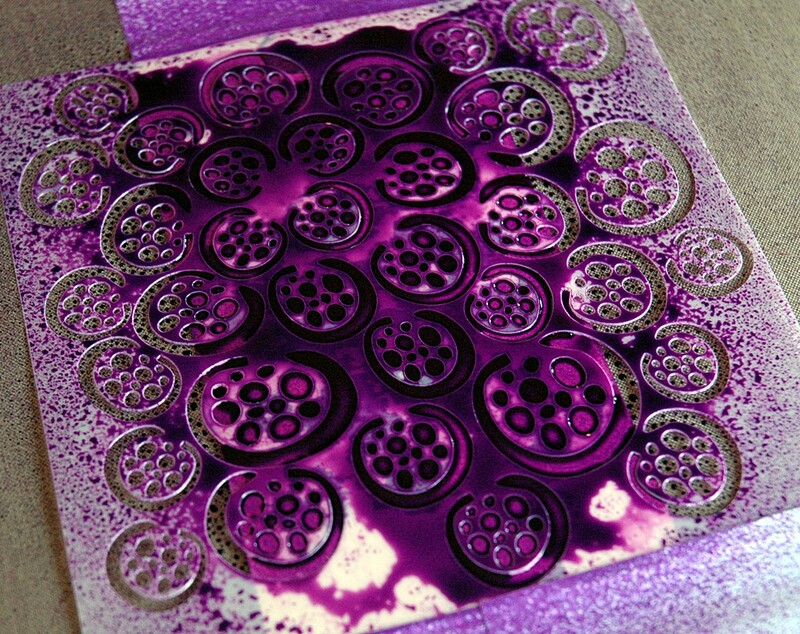 Add a little Glossy Accents and attach them to the back of the car, in the windows, with the coloured side facing out. 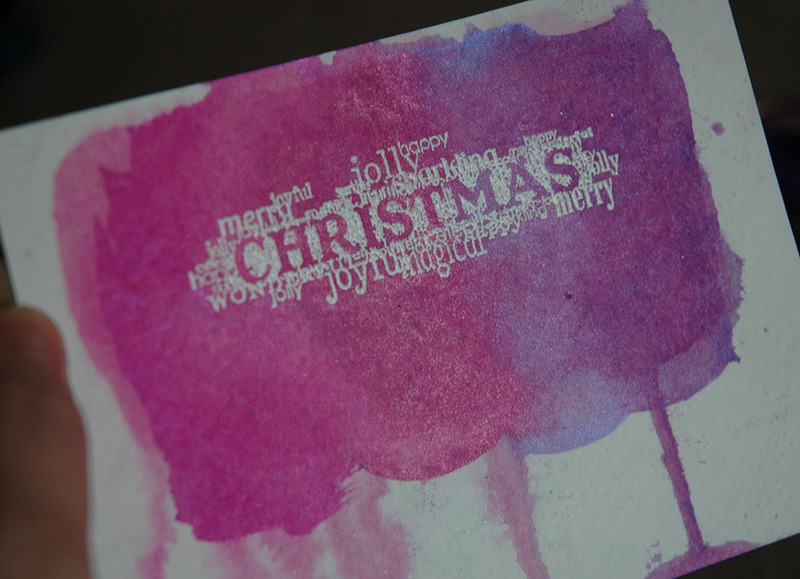 Cut three narrow strips from the scrap manilla tag and ink them with Iced Spruce, Faded Jeans, and Aged Mahogany Distress Inks. 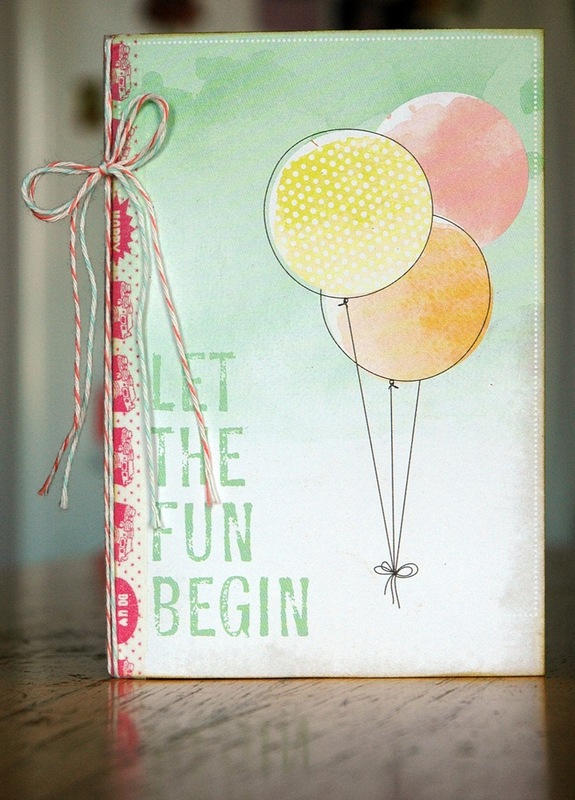 Add a dot of Glossy Accents to the back on one end and add a piece of twine. 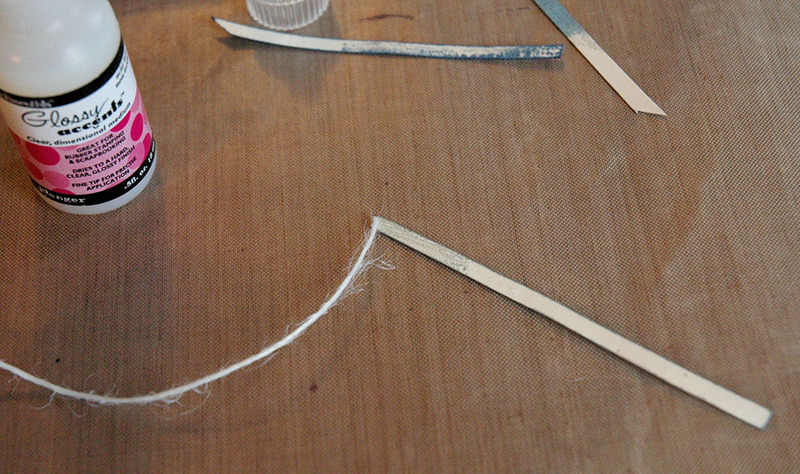 Wrap the paper around the twine until you get the size you want, then trim the end and adhere with Glossy Accents. Use a piece of tape to stick the three “tin cans on strings” to the back of the car. 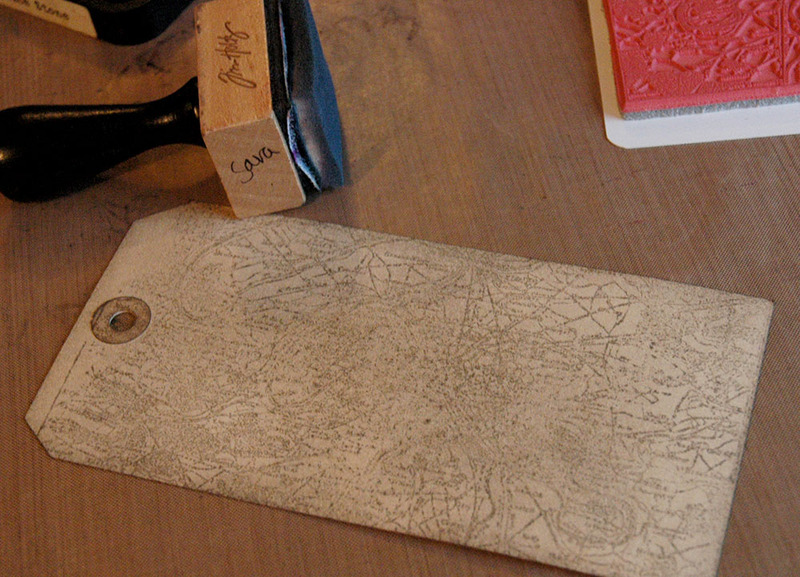 Set the car aside for later and get out the stamped tag. 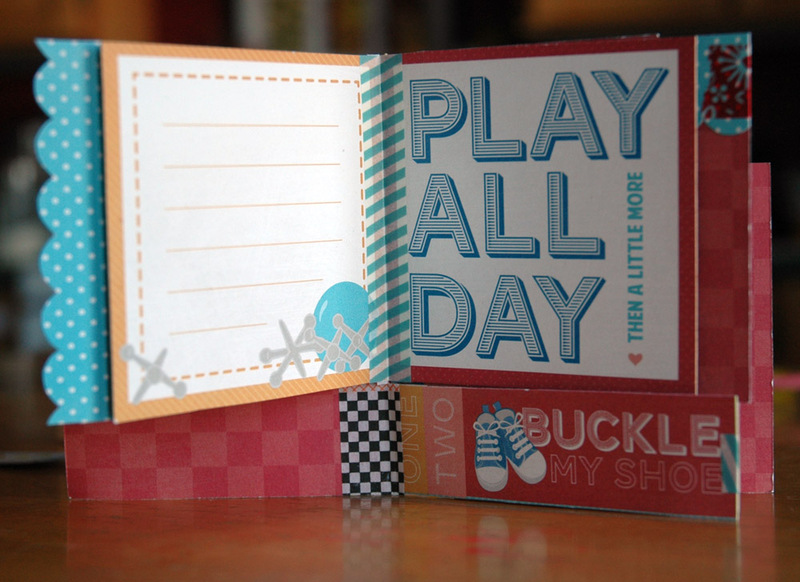 Add embossing ink to the edges and cover with clear embossing powder. As you can see, I wasn’t precise about it, it makes it look better this way. 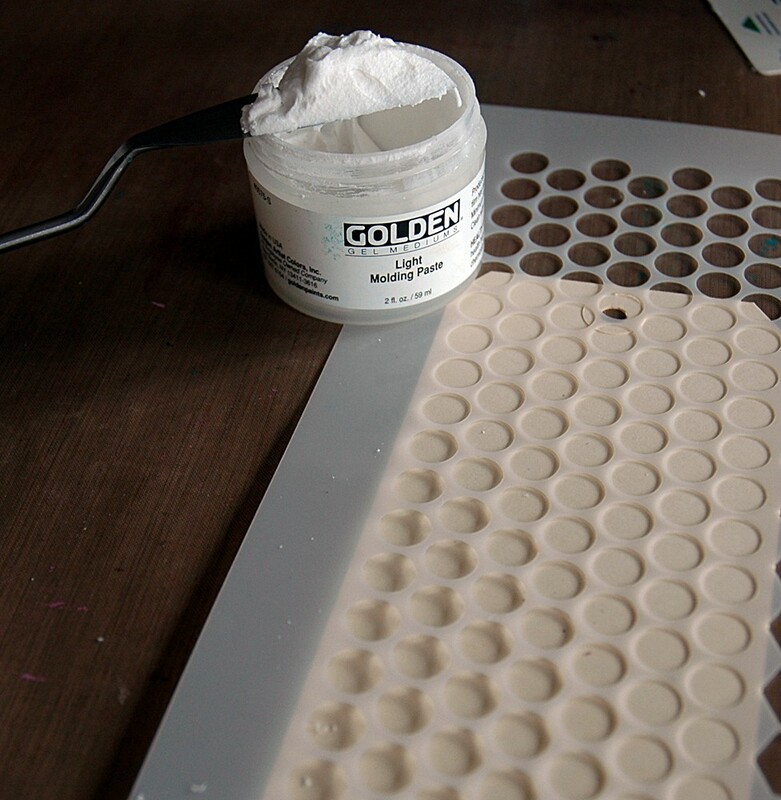 Now flick the tag to knock off a lot of the powder and then heat set the rest. 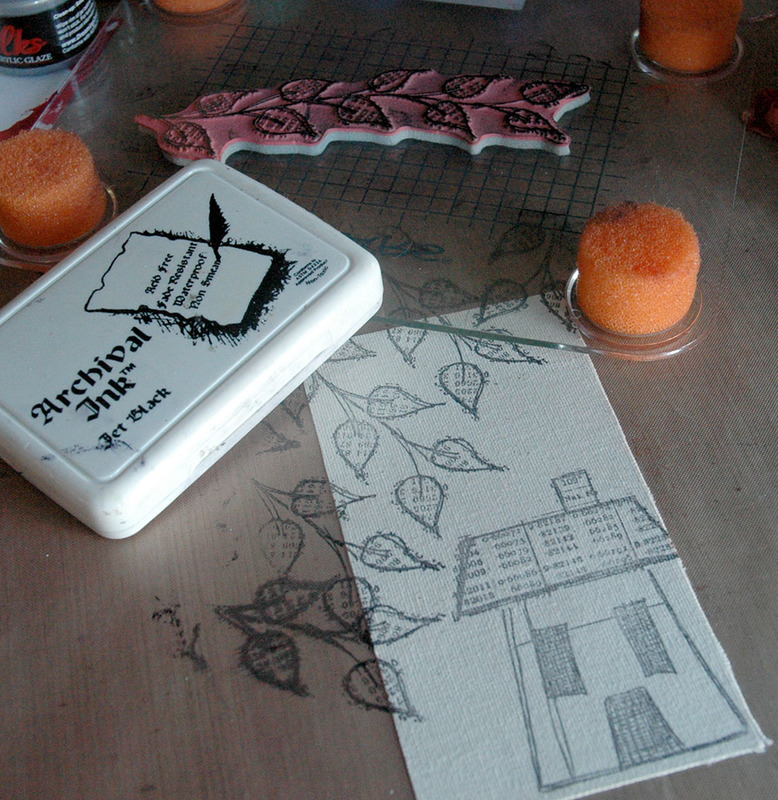 Use an ink blending tool with Gathered Twigs to ink over the embossed areas, then repeat the powder step again. 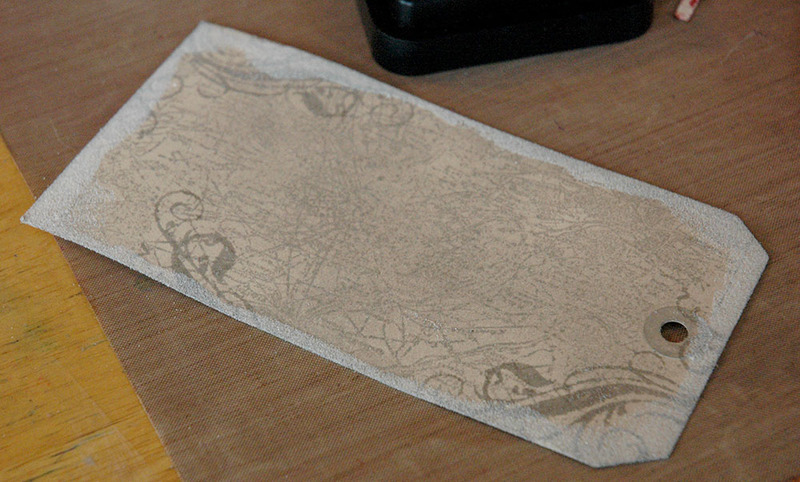 Next, ink with a darker brown, like Walnut Stain. You should see light areas under the powder and dark areas in between where parts of the powder were licked off then inked over. It’s a neat, aged look and effect. 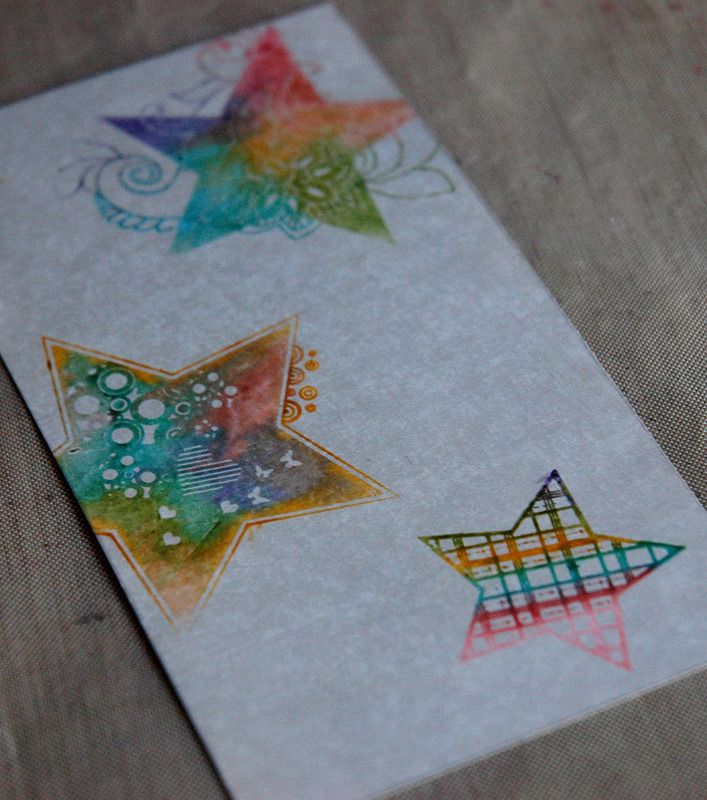 The darker you ink the top and the lighter you leave the base, the more interesting it looks. I left it pretty subtle for this tag but it was a bit more pronounced on last week’s. 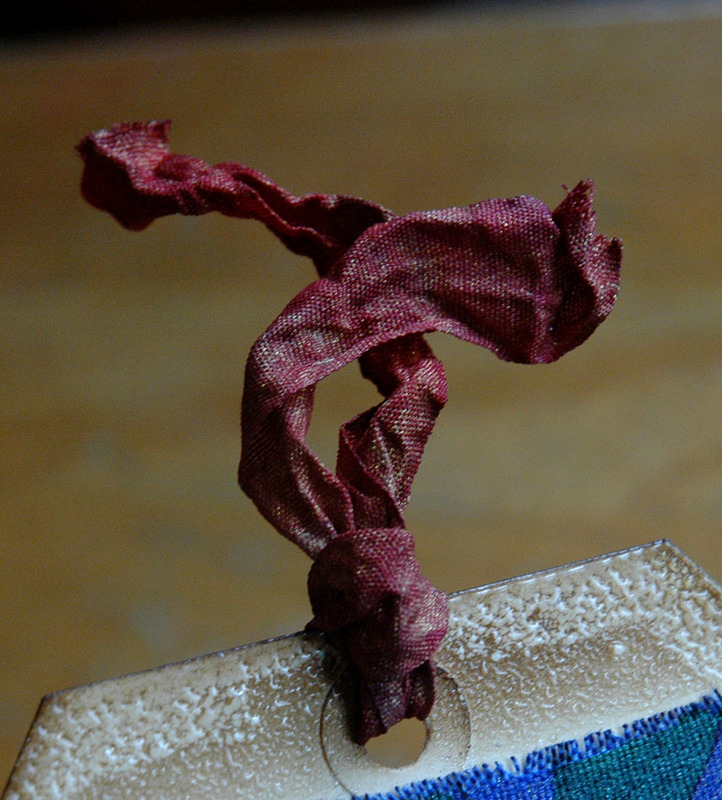 You’re going to need ribbon to finish off the tag so run the Aged Mahogany ink pad over some Crinkle Ribbon, then spritz with water to blend. 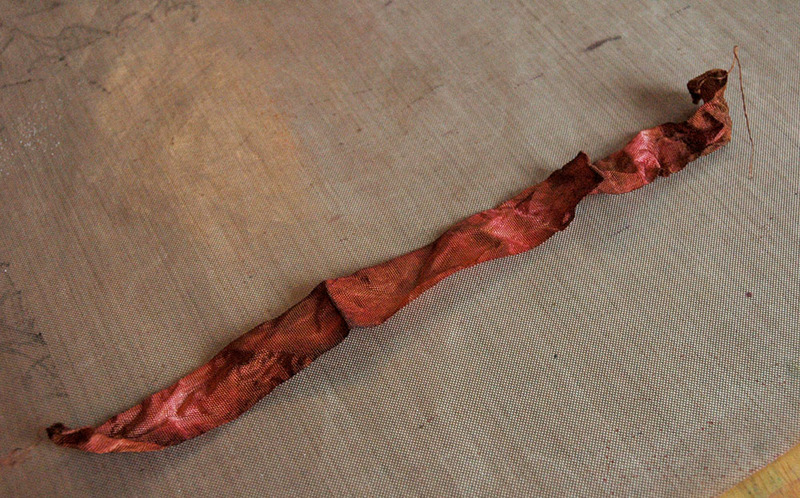 Crumple into a ball and dab with Gathered Twigs. 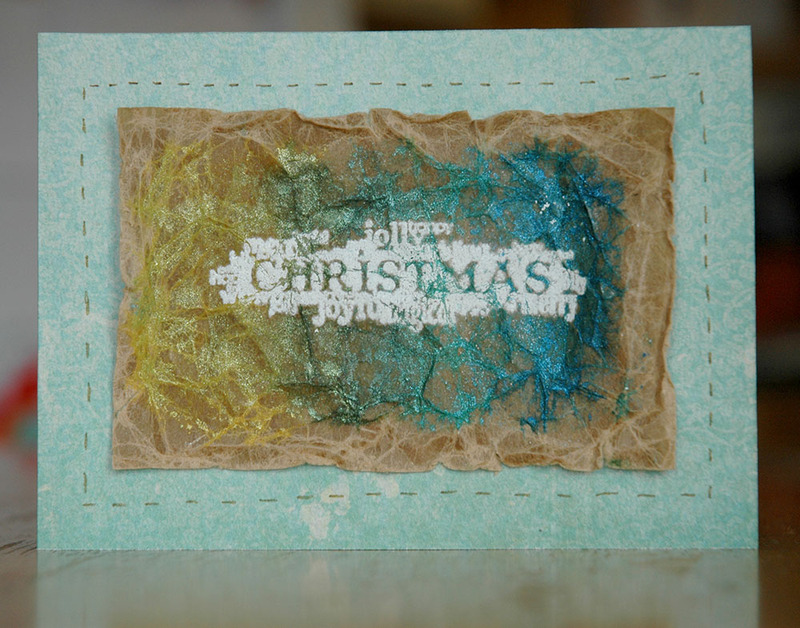 Let dry or heat set – the two colours should give an aged and faded look to the ribbon. Now, let’s put it all together! 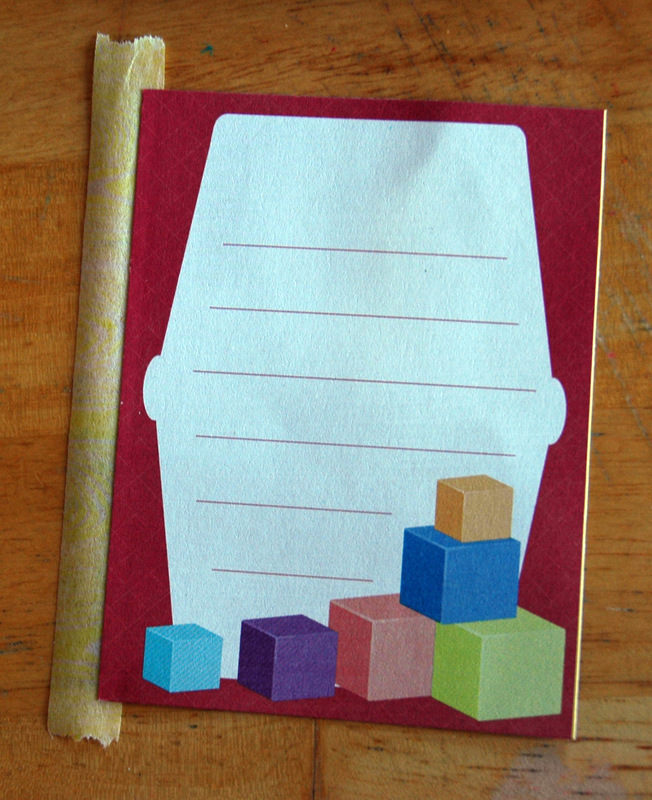 Add foam adhesive to the back of the car and adhere it to the left of the stamped and embossed tag. 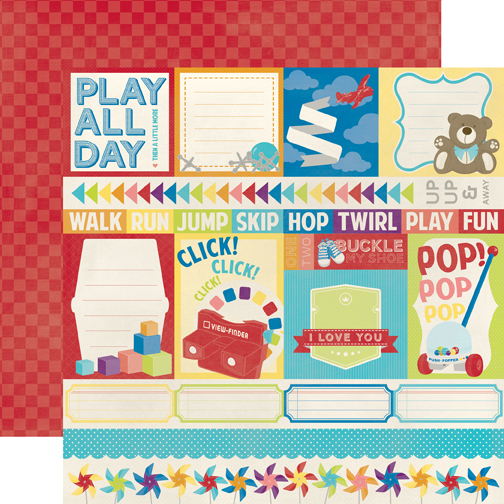 Get some word stickers and add them to the top right corner of the tag. 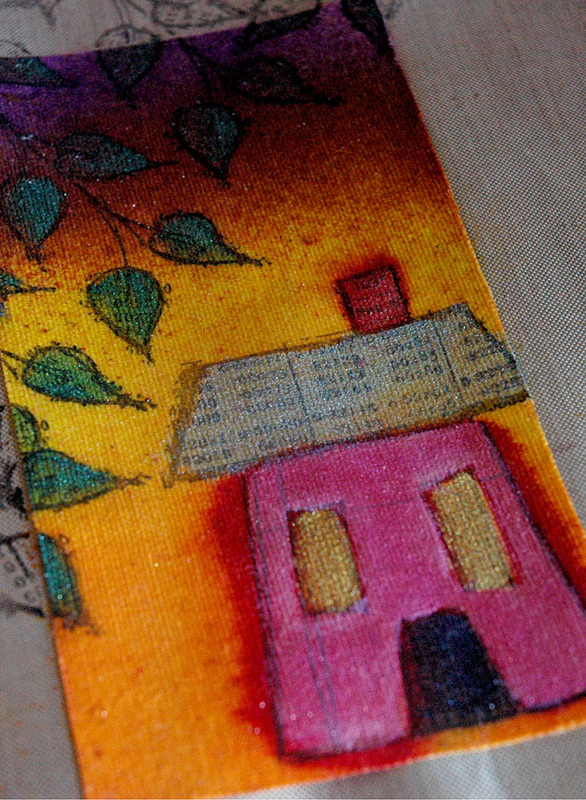 Thread the ribbon through the hole in the tag. 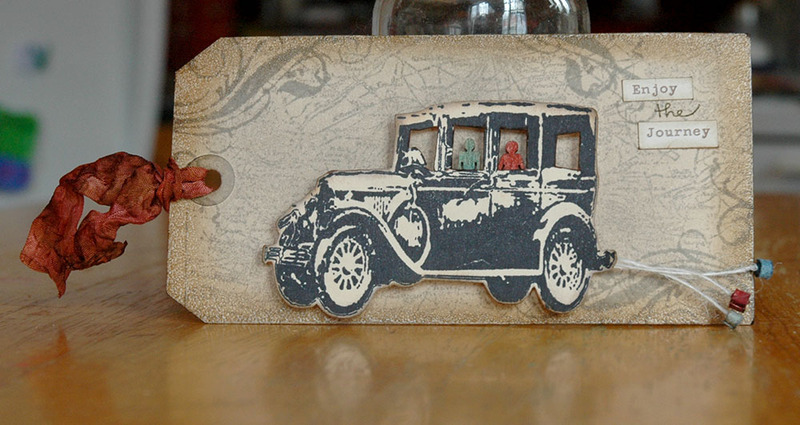 If you want, adhere the tag to a card and go party at a wedding! I really love this tag and it makes me sad that I have no weddings that I can bring it to. 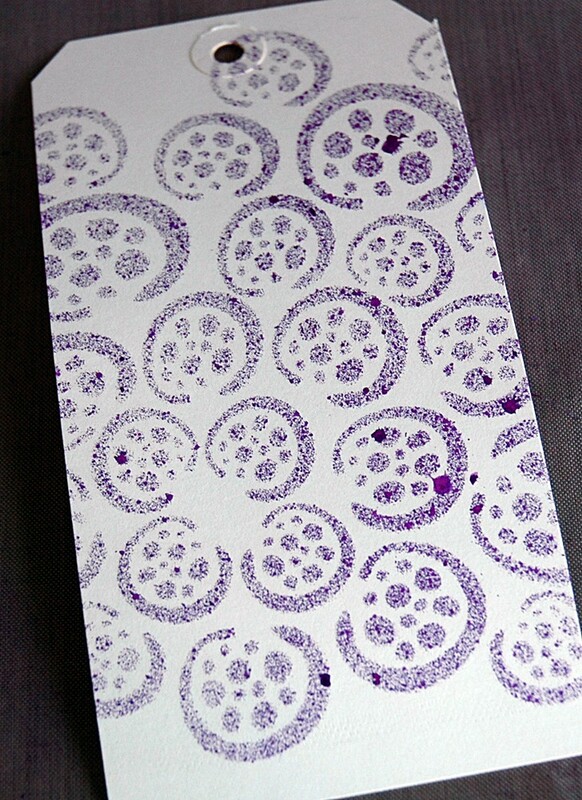 So, leave me a comment and I’ll randomly pick someone to get it – if you’re lucky and have a wedding on the horizon, the card will already be done for you (and I will add it to a card before sending it off)! 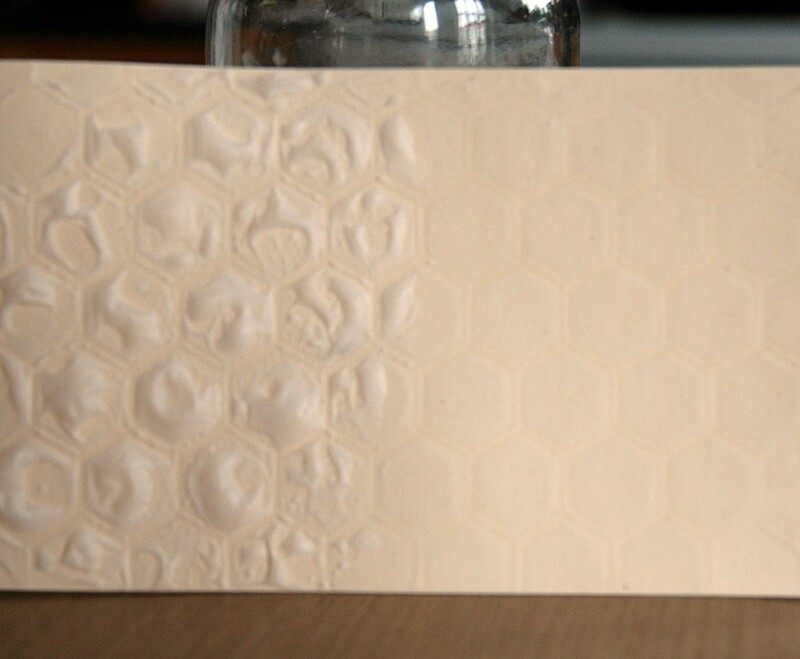 Link me up if you try out the embossing technique, I’d love to see how it turns out for you! Tuesday Techniques and Tutorials aka Hello, my pretties! Silks than an actual tutorial but I hope you like it anyway! 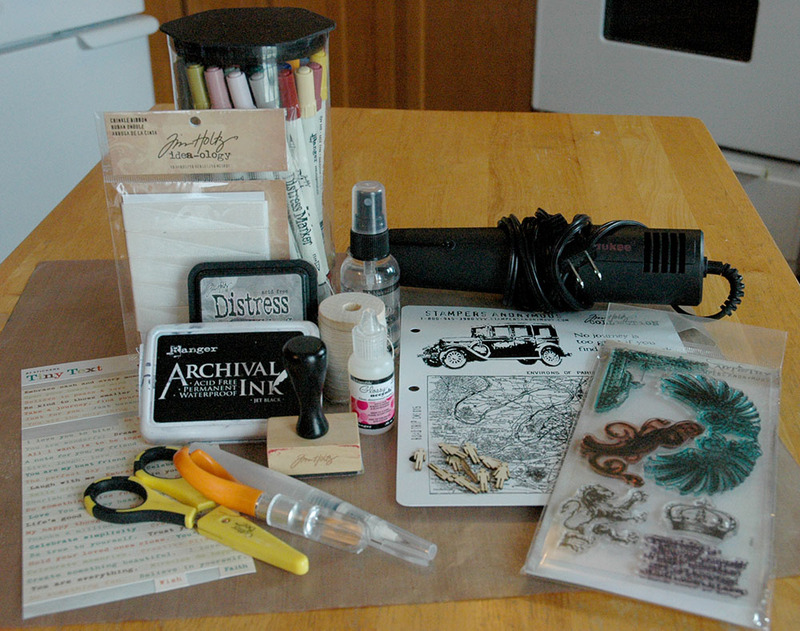 Silks, Sticky Back Canvas, Craft sheet, paint brushes, Archival Ink, and stamps. To begin, Silks are a Luminarte product, as in the people who make my beloved Twinks, so you know they’re going to be awesome and shimmery! They’re a water based acrylic glaze which means they’re not permanent or opaque but really fluid and translucent – and shimmery! For the first tag (sorry there are no pictures of the process, my camera battery died and my little point and shoot just wasn’t up to the challenge, sad) I simply painted the Silks over the Sticky Back canvas, blending as I went, and let them dry, making a background. 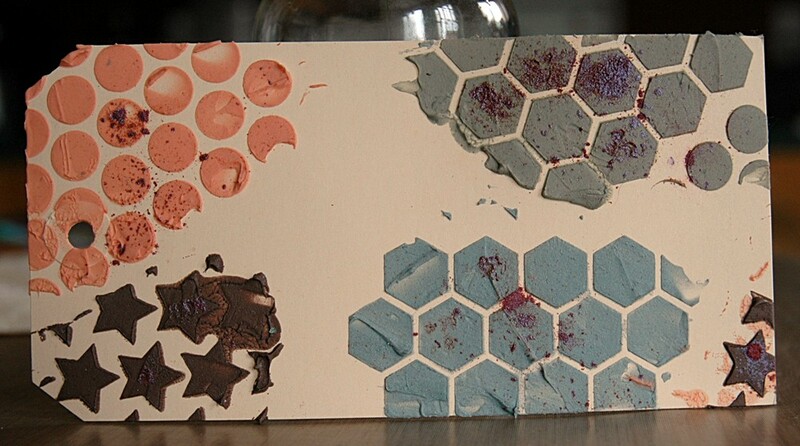 The beauty of these paints is that they don’t mix together and make mud colour – they just blend and stay gorgeous! 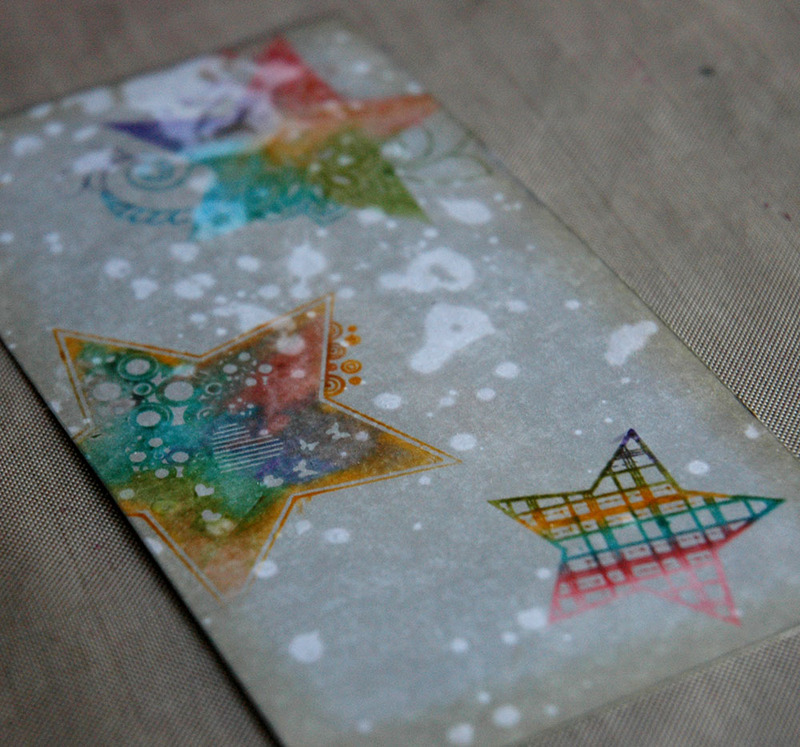 Once it was dry, I stamped the images in Archival Ink and then painted them in with more colours of Silks. As you will see, no muddy colours, just awesomeness! And great shine! 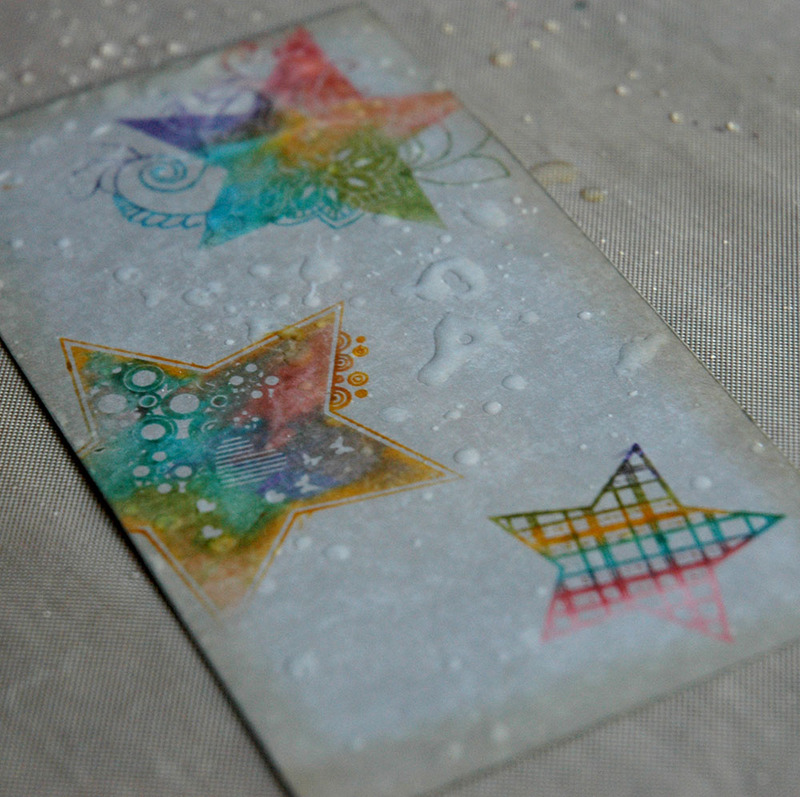 This looks all wet and messy because I have found that on canvas the paint covers better and easier if I wet the fabric first. You do want to be careful because if you use too much water (I have 4-5 layers of paint and water on the house) you will get this wicking of the paint happening. 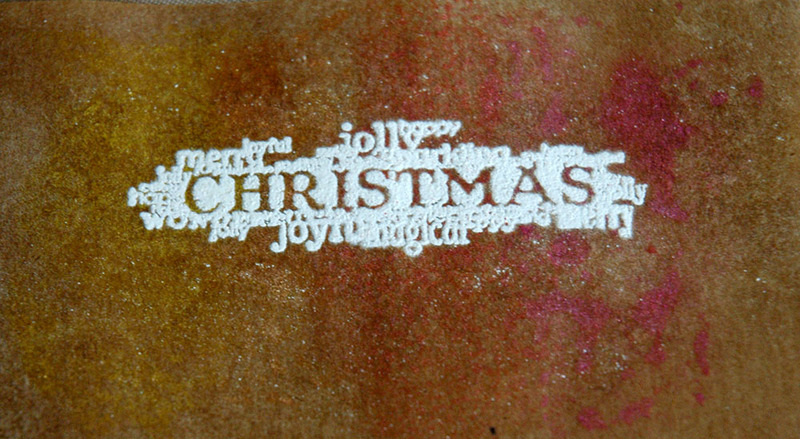 Not an issue for this tag, I have plans to disguise it and the style of the stamp lends itself to an imperfect effect anyway. 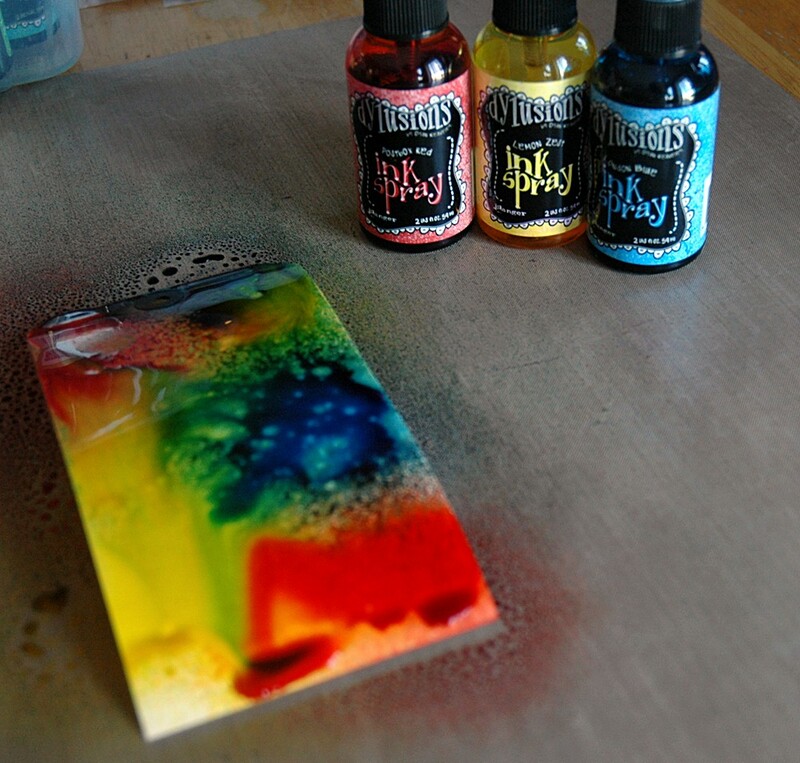 Once the paint was dry, I misted over it with Dylusions Spray Inks and then misted lightly with water to blend them a bit. 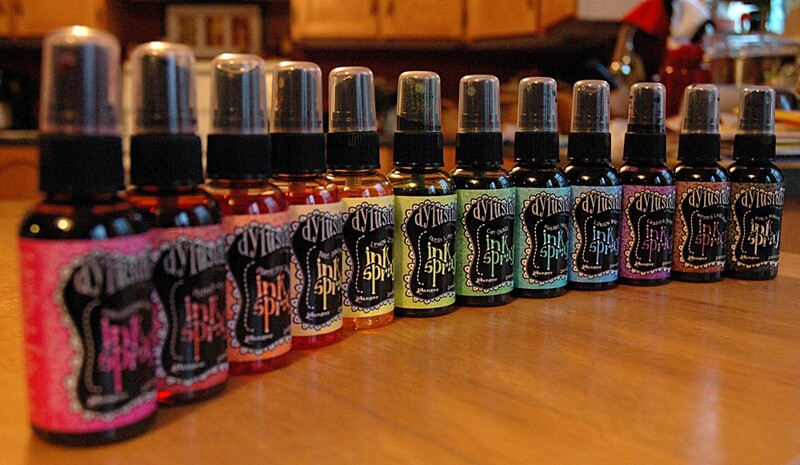 You can already see that the Silks are resisting the sprays and keeping their intense colours – love it! 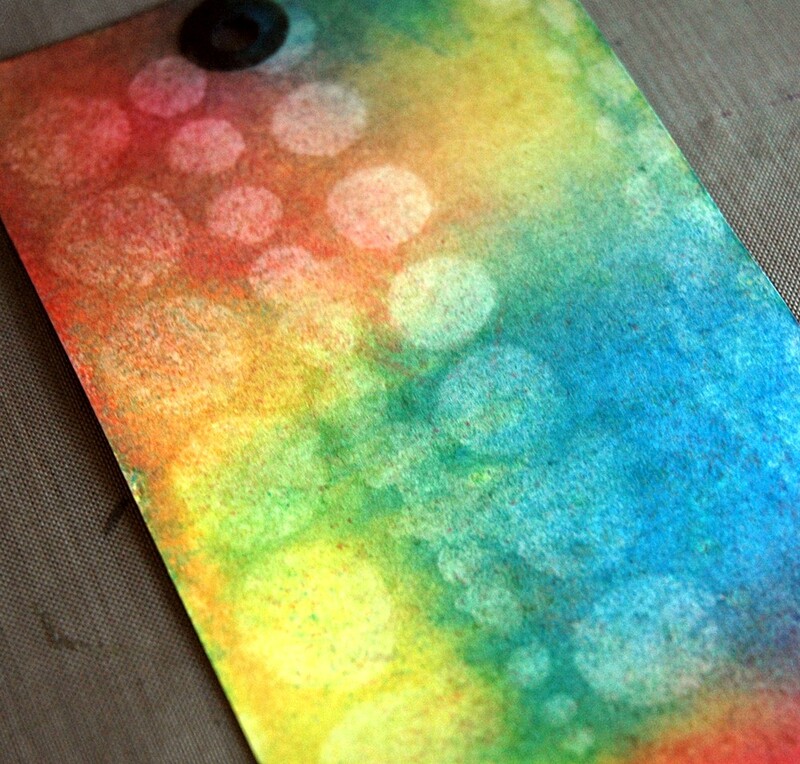 You can also see that the shimmer comes through and resists the mist too – so cool! 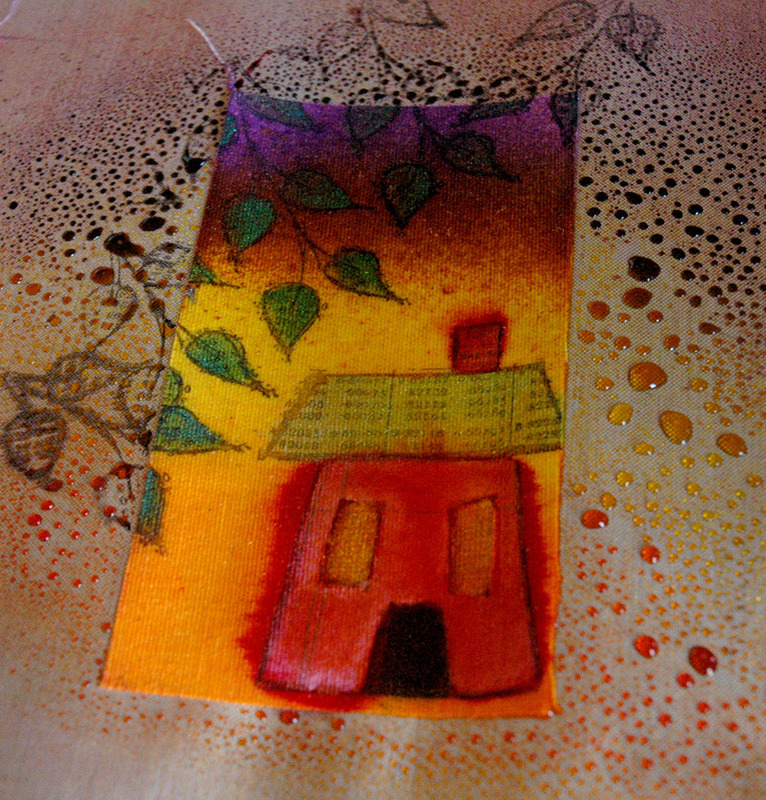 And a good black mixed media pen disguises the wicking flaws! 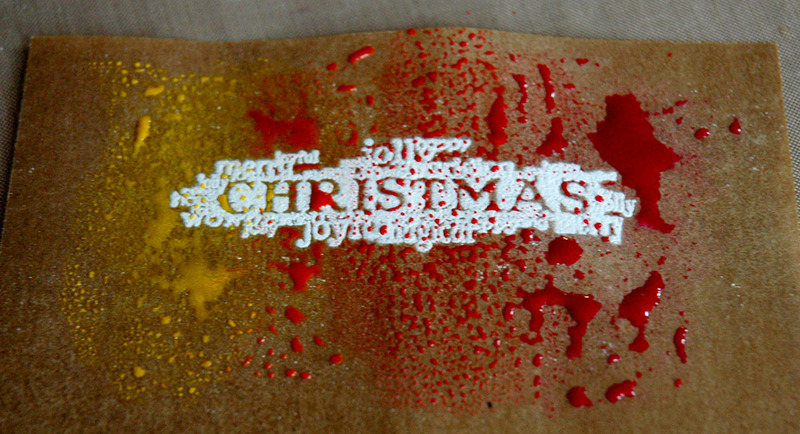 I didn’t do anything with the tags except add crinkle ribbon because I really just like them as they are. 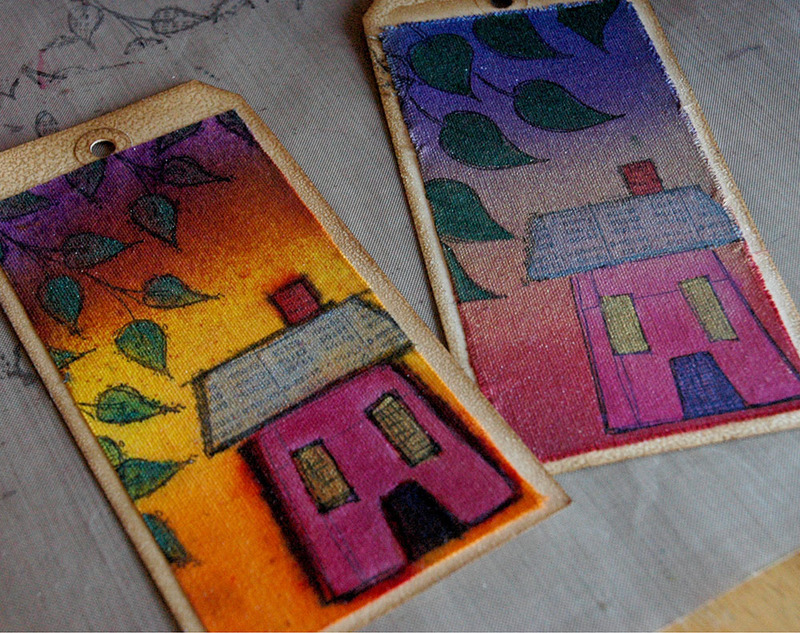 The ribbon for the first tag was painted with the Silks and it has awesome shimmer plus is just a little stiff – enough to hold some shape. See the top of the tag? Easy and cool technique that I’ll try to remember to do next week! 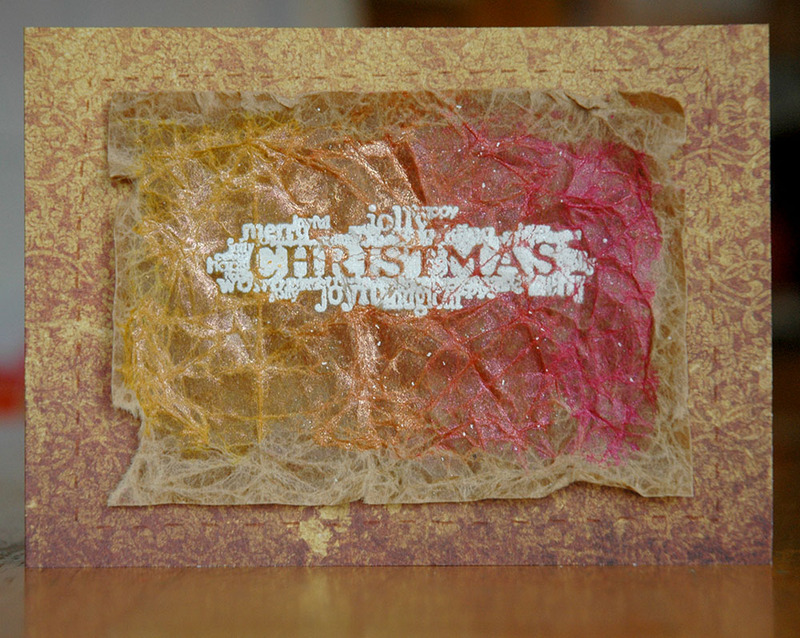 I love the softness and overall shimmer of this one. 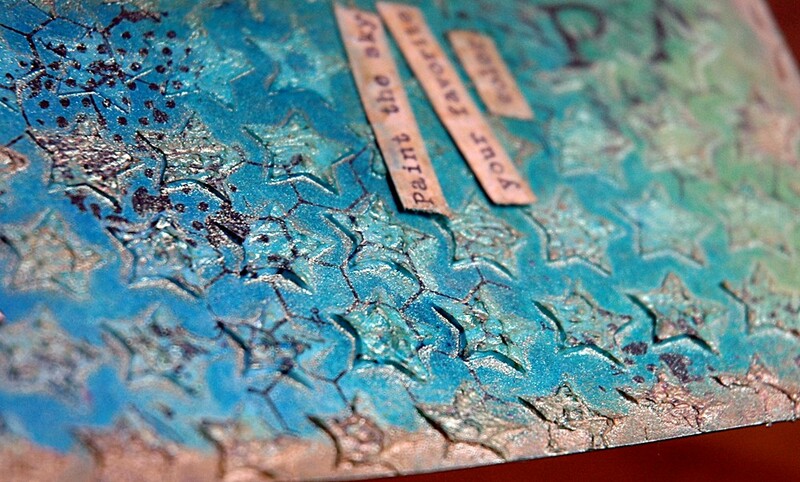 I think this is my favourite – I love the contrast of the shimmer paint and the matte mist and the colours are amazing! Click on any of the pictures to make them bigger and see the shimmer a little better – I only wish I had the skills to really photograph it! 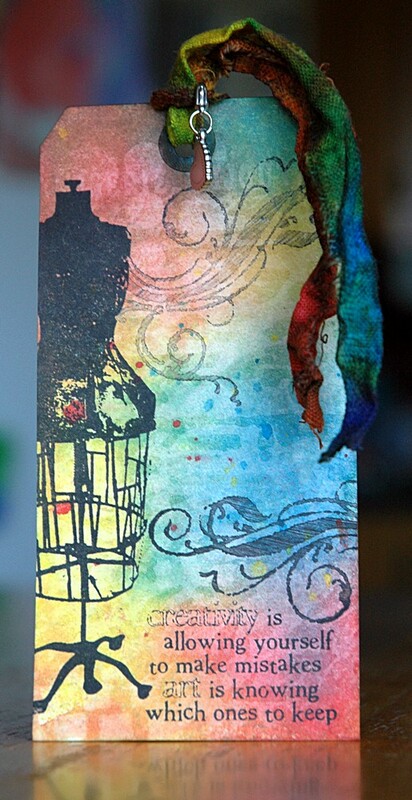 Let me know if you have played with Silks and show me what you’ve done – I’d love to see it! And if you don’t have any, go get some, really, they’re worth it! 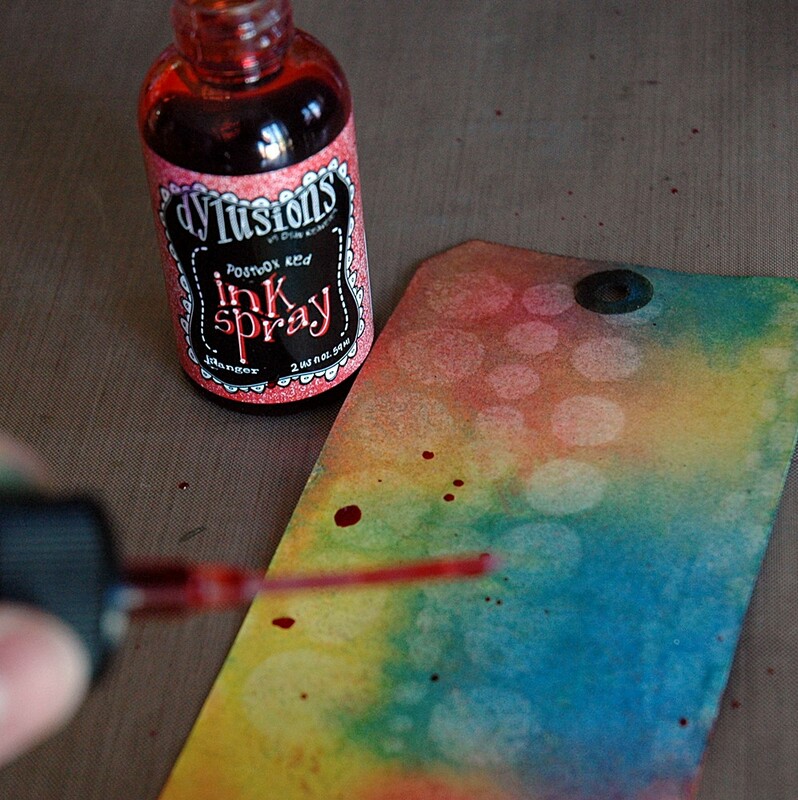 Finally, I’m back with another technique, and it’s one of my faves – Distress Marker Resist! 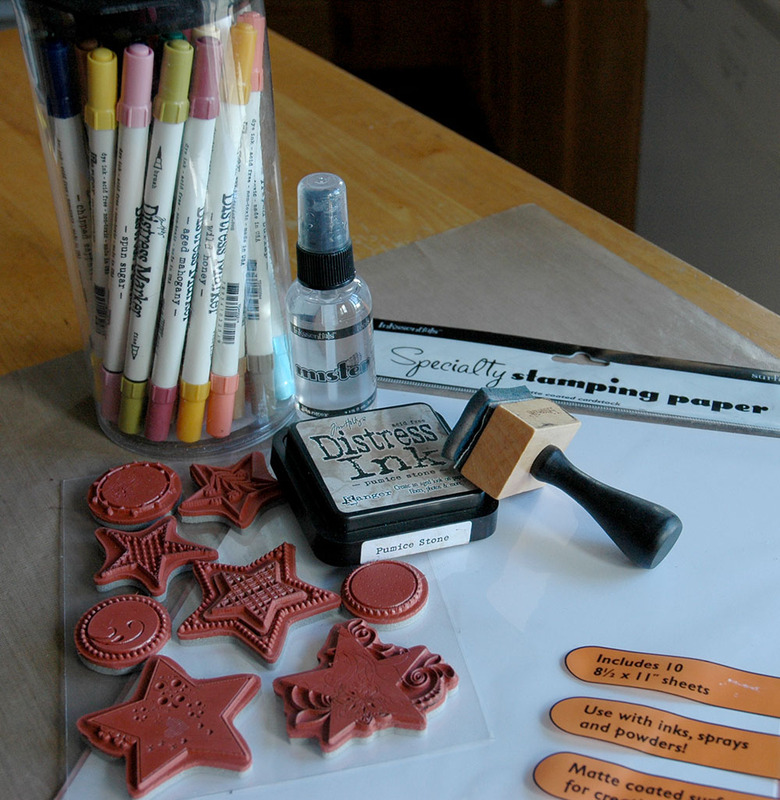 Distress Markers, Specialty Stamping Paper, Distress Ink, an Ink Blending Tool with foam, and a stamp (I prefer rubber). That’s it! Pretty limited and simple supplies but the specific items are a must. 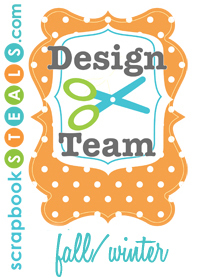 I have tried this out with Stampin’ Up! 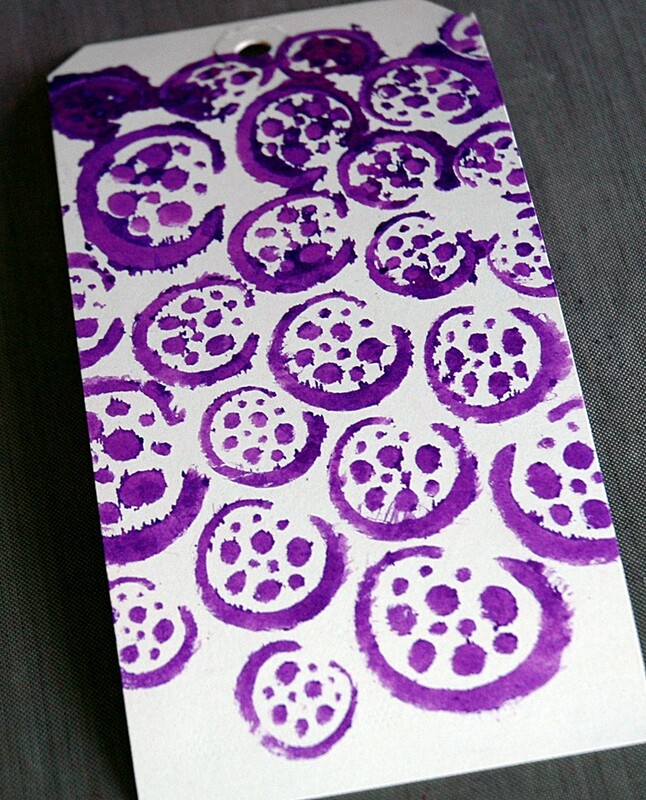 markers and found that it didn’t work as well, plus, the paper it a definite – this won’t work on other surfaces! 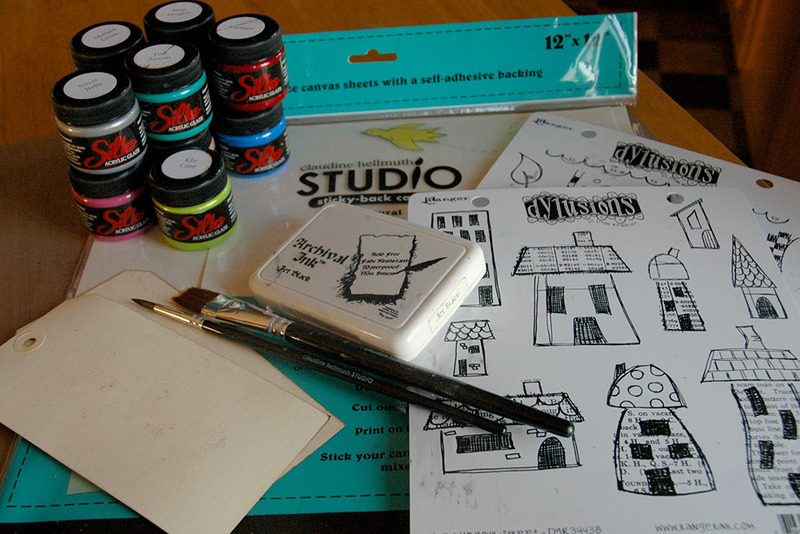 This is why I like the Distress Markers and a rubber stamp – I find the rubber holds the ink better, and the Distress Markers don’t become muddy or cross contaminated, even if I decide I want to go in with a light colour after already doing the dark colours. 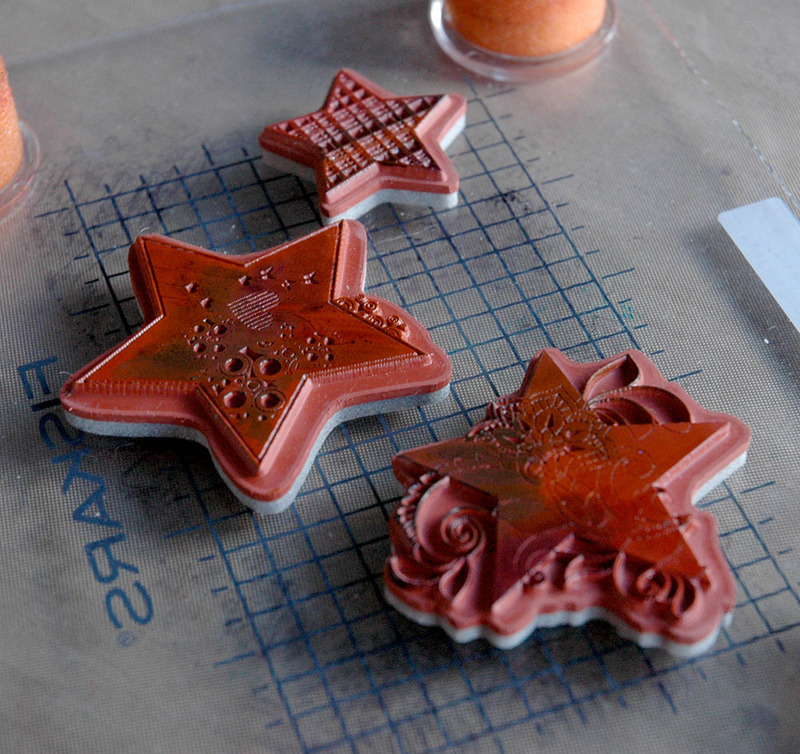 You can mist before stamping, but for this technique I like a crisp impression so this is one of the rare times where I will stamp without misting it first. Allow the image to dry. 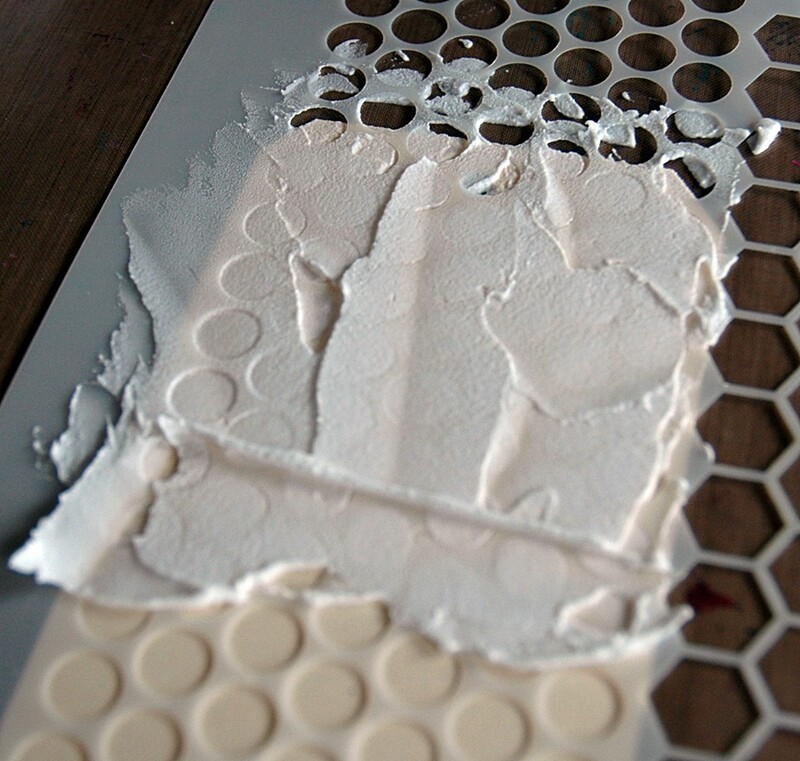 This only takes a minute but you don’t want to smear the image so make sure it is dry, even hit it for a second with your heat tool if you like. 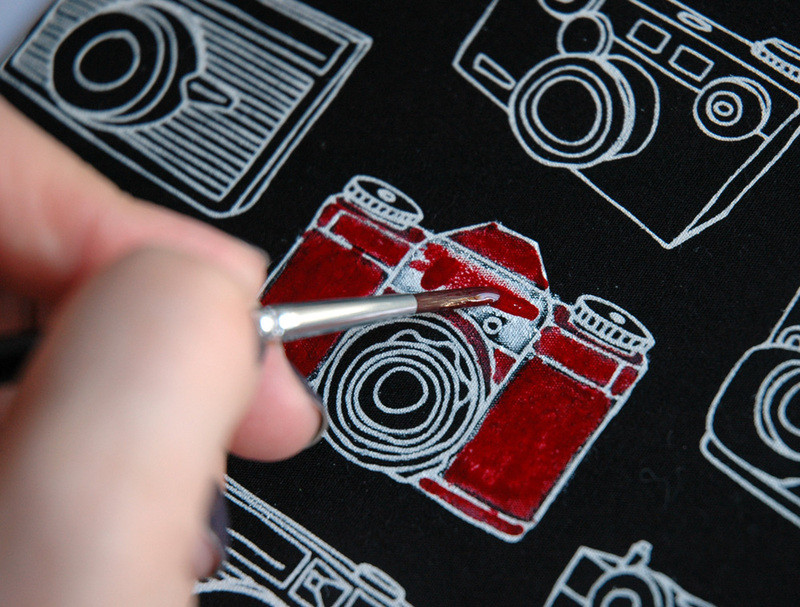 Can you believe how sharp the impression is with markers? Great definition! 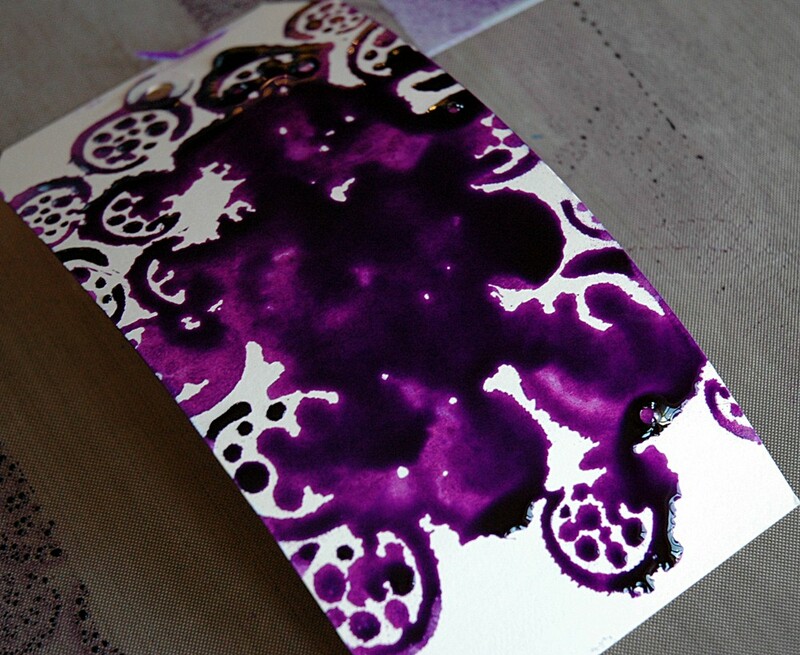 Can you believe how the markers resist the ink? Like magic to me every time! 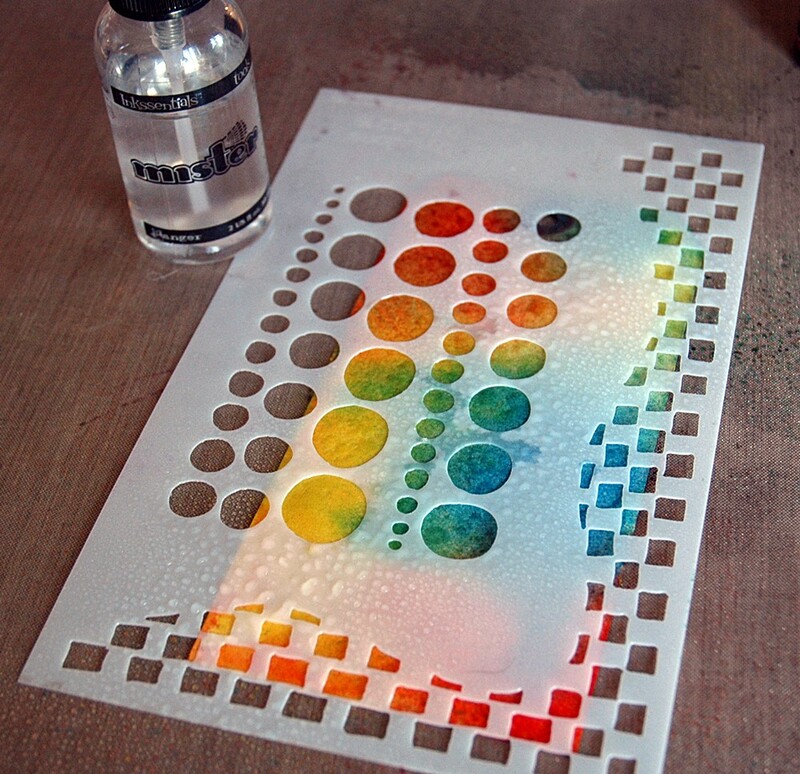 Blot away the water drops and you instantly have a multilayered background without lots of time and fuss! 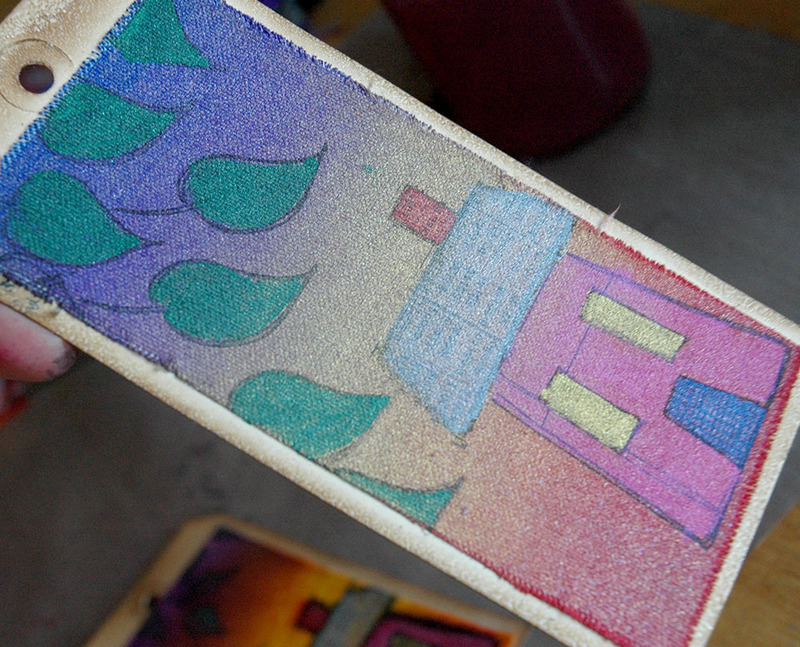 If you have Distress Markers and want to learn more fun things to do with them, or are on the fence about buying them, check out Wendy’s demo at The Paperie retreat if you’re lucky enough to be going. She’s going to be showing a bunch of tips and techniques with them and she’s always got something fun I never thought about up her sleeve! 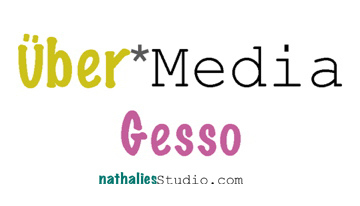 Let me know if you try this one out – you know I love to see what you make so leave me a comment and a link! 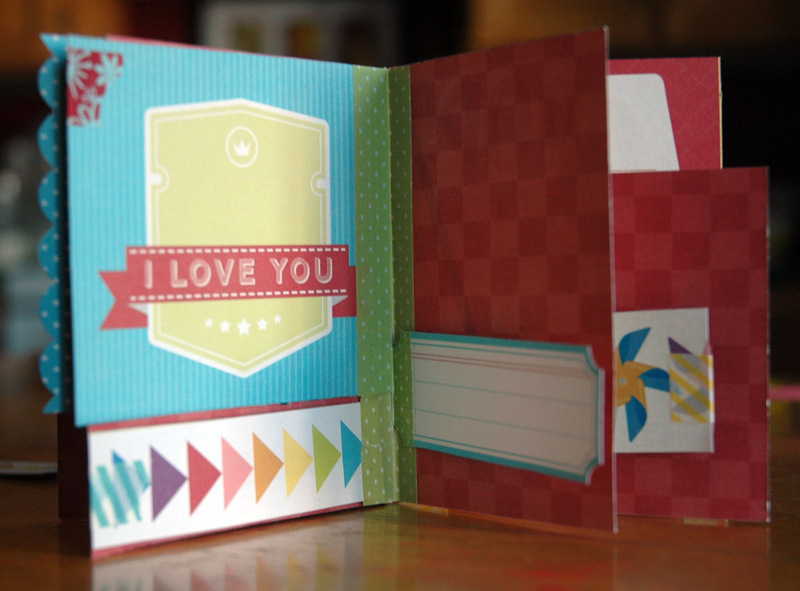 …I had made from one sheet of patterned paper and washi tape. That was it. 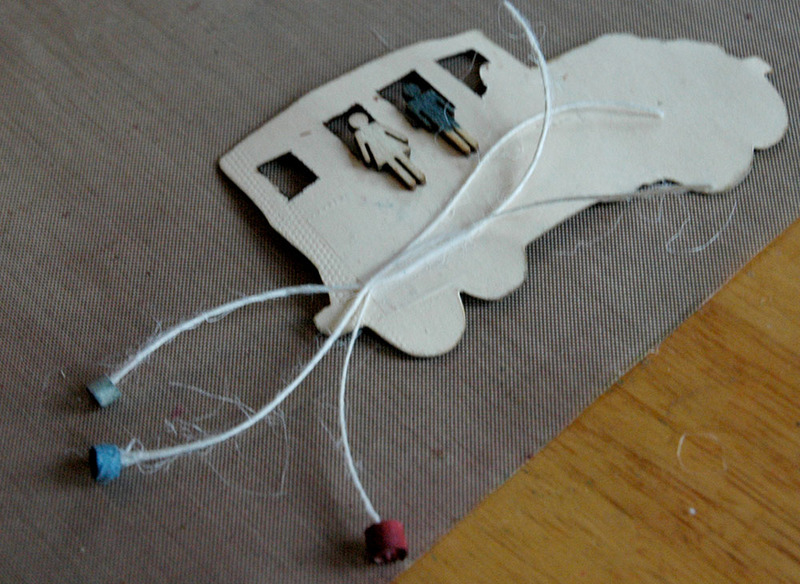 Oh, and I threw on a bit of unnecessary baker’s twine at the end. I said it then and I’ll say write it again, this is the easiest and smallest kit you’ll ever pack for a trip or crop! A couple of people asked for detailed instructions so here they are! 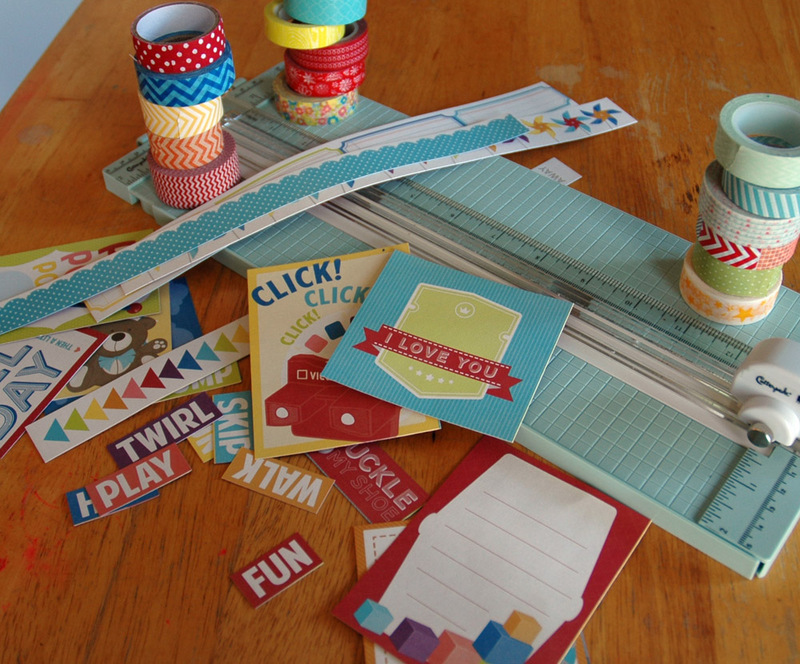 A paper trimmer and/or scissors, a pen for journaling, one sheet of patterned paper, and coordinating washi tape – as much or as little as you like. 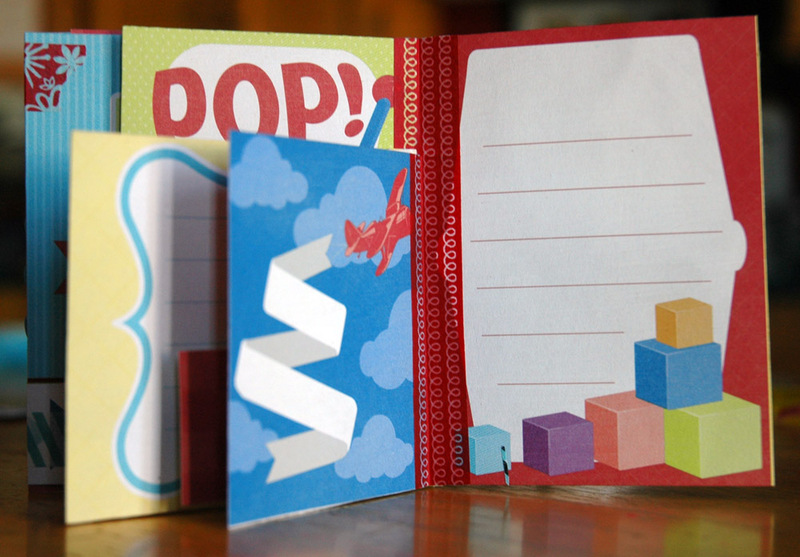 You could really use any patterned paper you want but I love the sheets full of cut apart elements – they just seem to cry out to be made into minis! 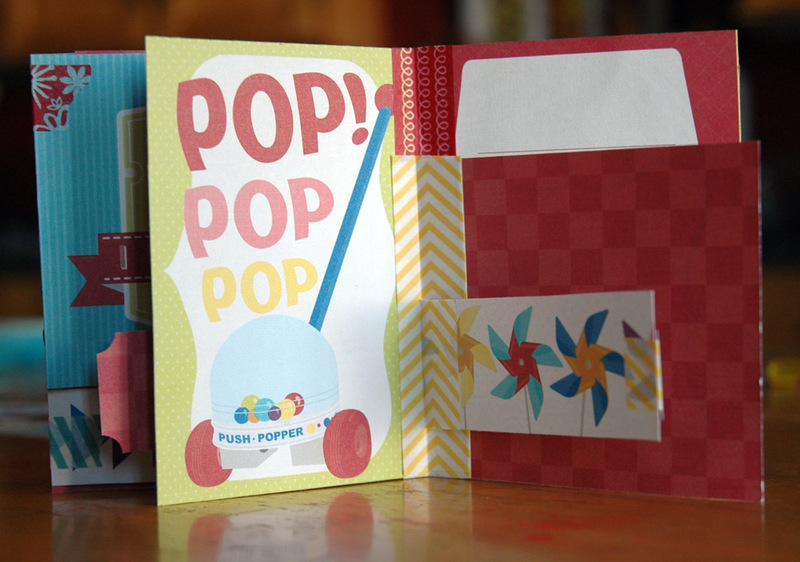 This time around, I used a sheet from Echo Park‘s mini line, Toy Box. 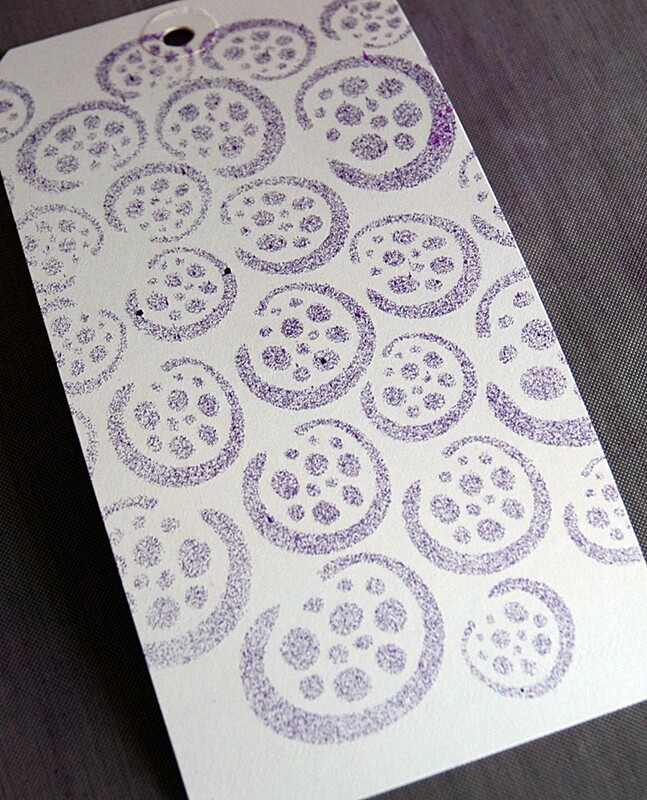 The nice thing about the “Jump” sheet is that it has great embellishment elements as well. 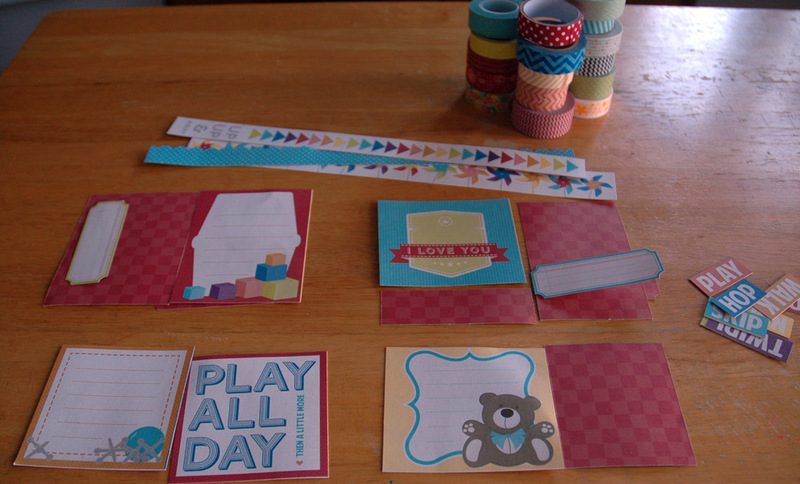 First of all, just cut everything apart and trim out any elements you need – for example, I cut apart the words and tickets, and trimmed the scallop border. 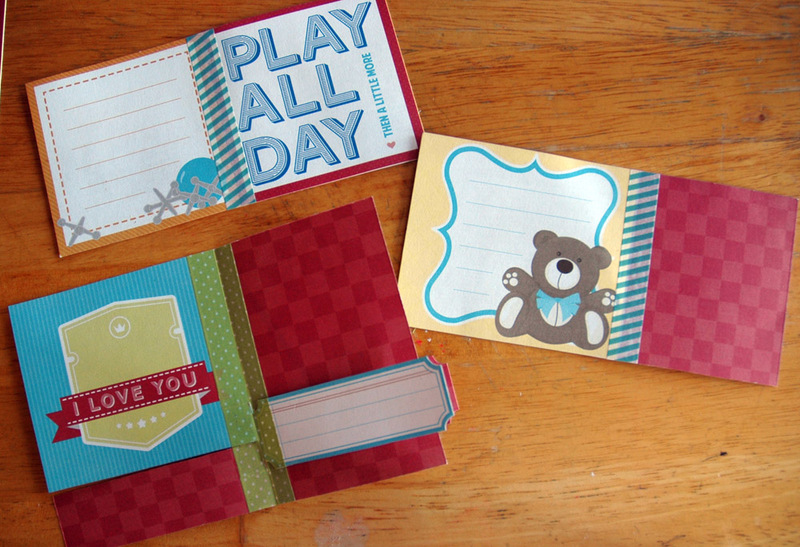 Next, lay out your pieces in order from front cover all the way to the back, then group them into pairs, with the covers being a pair and adjacent interior pages pairing up. 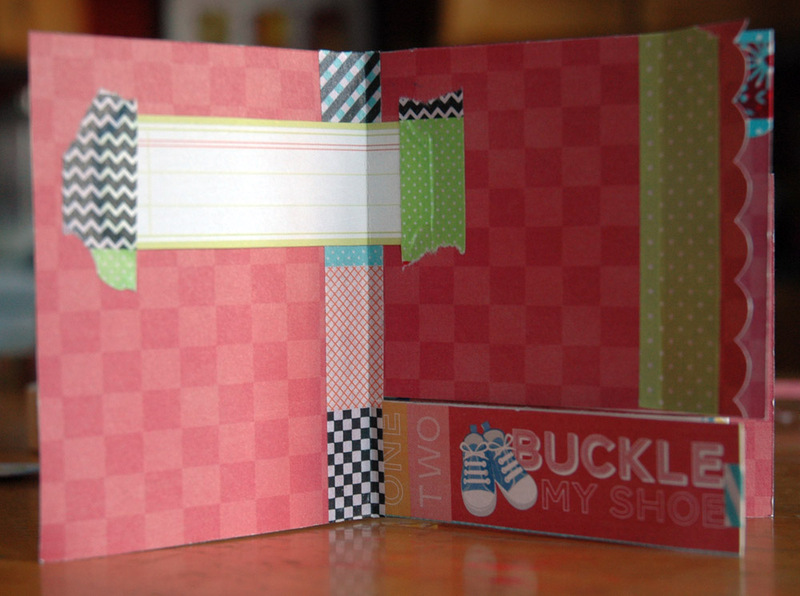 Next, use washi tape to adhere each set of interior pages to each other, but only use washi tape on one side. 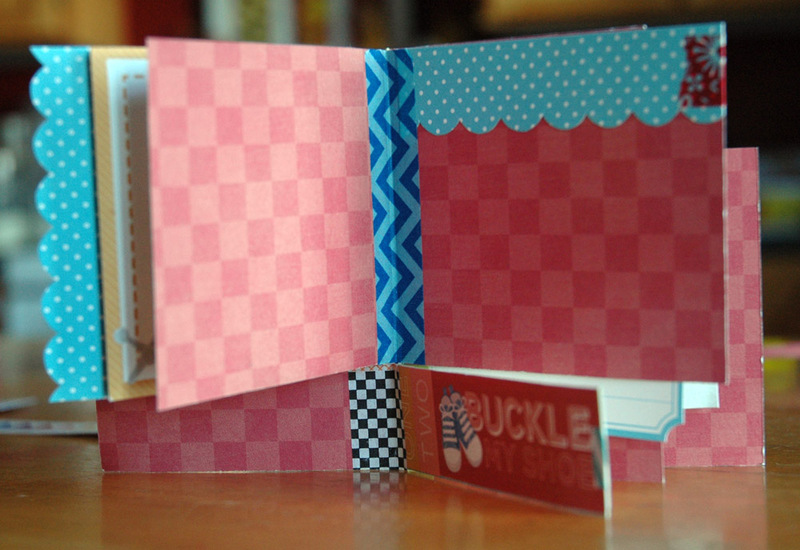 Finally, add a strip of washi tape to the front cover, on the exterior left. 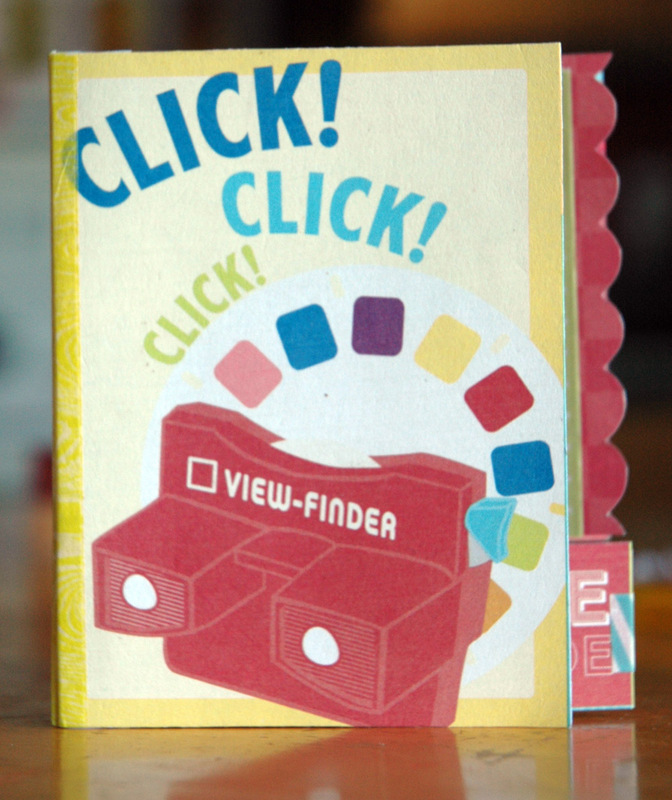 Add a strip to the back cover on the exterior right. 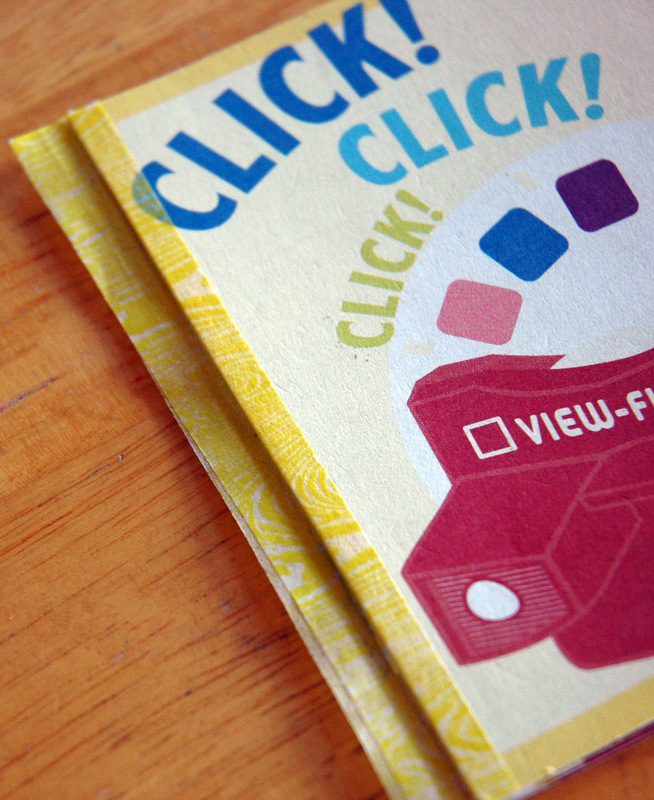 Now, sandwich your stack of interior pages between the covers and press the two pieces of washi tape together, forming a flap. 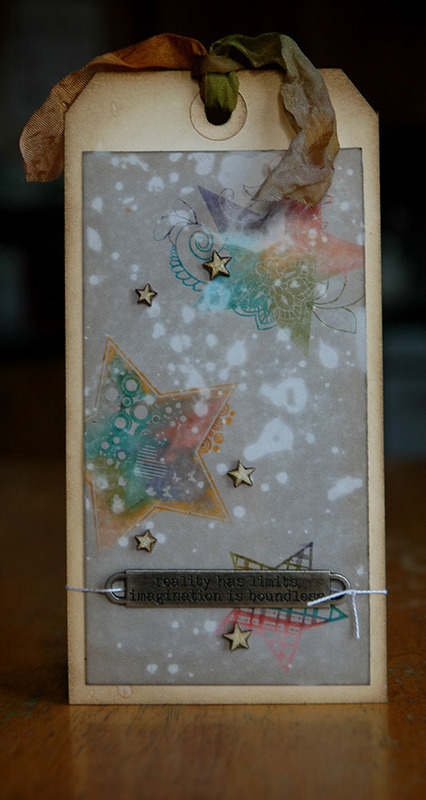 Use one more strip of washi to wrap around the whole spine, pressing down the flap you created a moment ago. 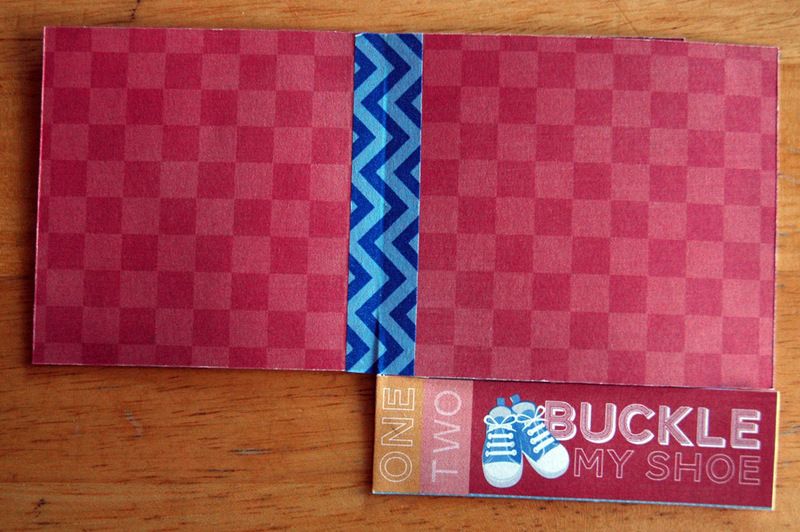 I did stick in some of the borders but left the words to add once I put in my photos. Obviously, at this point you could make it much fancier and add more details and embellishments but essentially, it’s finished! I hope you try this out and tell me about it in the comments – I’d love to see your mini! 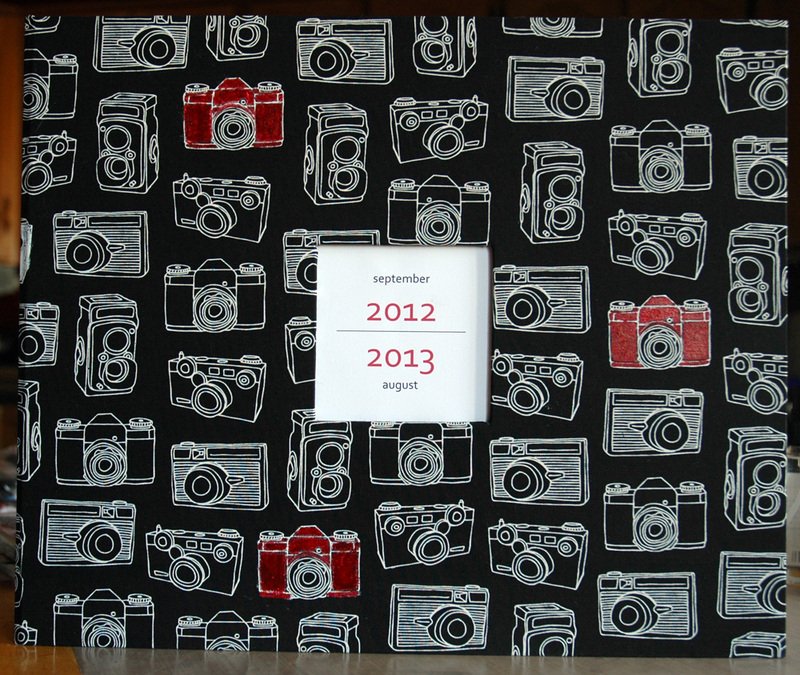 To me, it looked like the perfect album for Project Life! 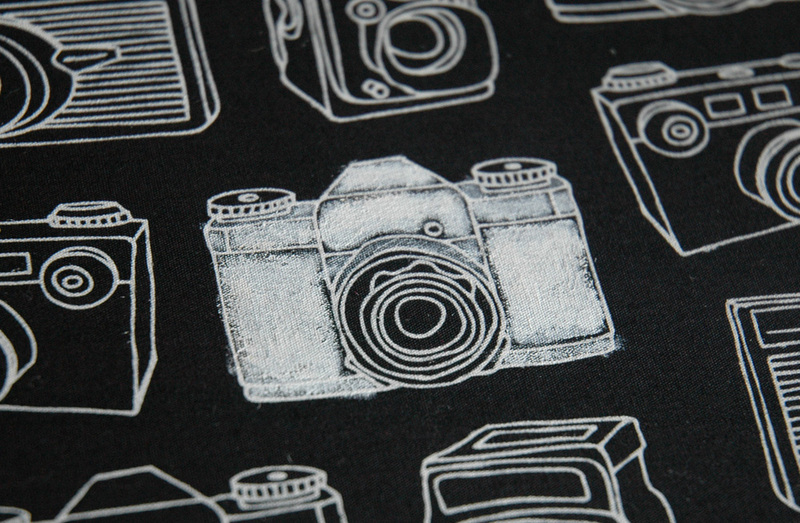 One small problem, I wanted some more colour – black and white is not normally my go to colour combination! A little while ago I saw this post and video by Ronda Palazzari and I thought it was the perfect solution to my album cover! 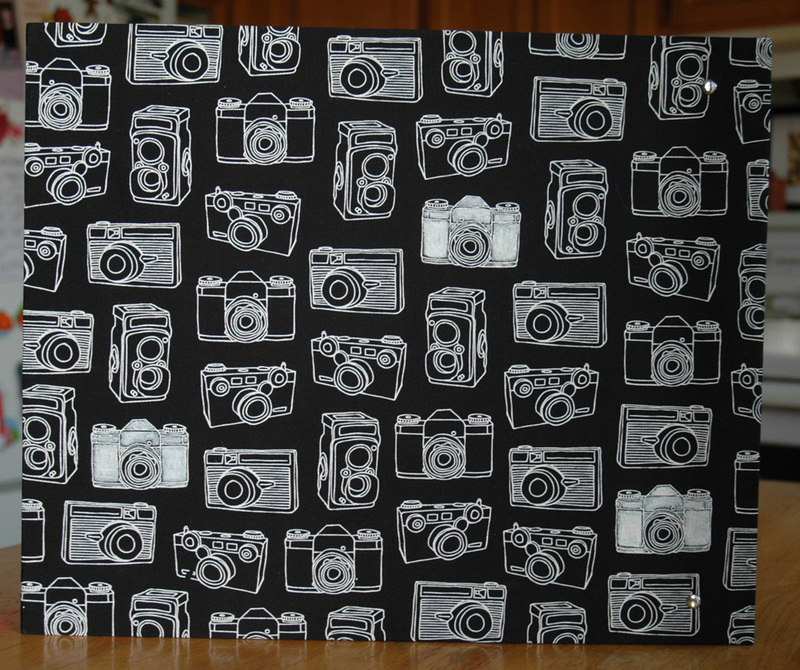 I didn’t use stencils, but I did decide to paint the cameras, some of them anyway. 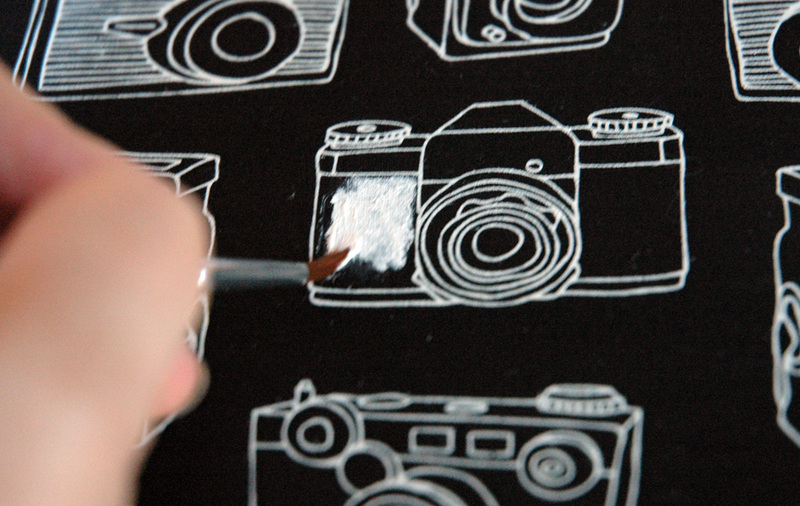 I started by painting a few cameras with Titanium White Golden acrylic paint. I wanted the colour to really pop so I needed a light layer beneath to cover the black, kind of like using primer on your walls. 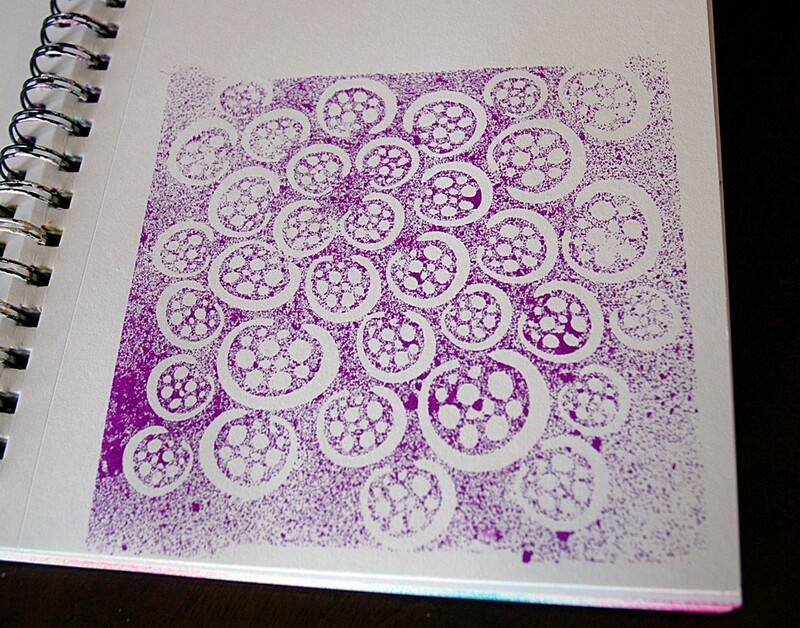 …I wasn’t very particular about covering the whole area neatly. 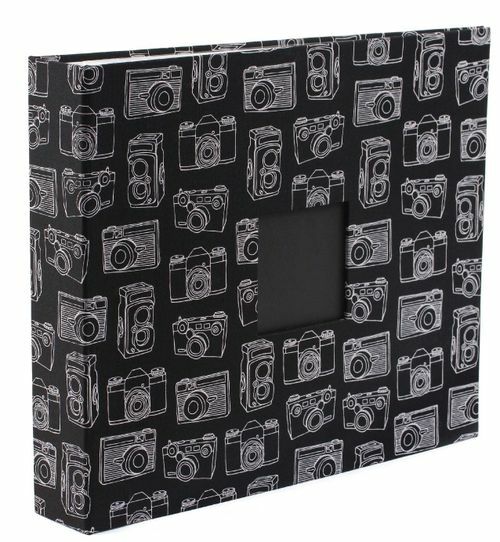 I only did three camera on each of the front and back covers and I liked the look so much that I was very tempted to leave it just like this! However, I had it in my head that I wanted red cameras so once the white paint was dry, I broke out my favourite Twinkling H2O’s and used the Poppy colour to paint them in. Again, you can see that I wasn’t fussy about the neatness. I like how the pops of red turned out, but I may add some more colour later. I’m still debating whether one colour is enough or not! 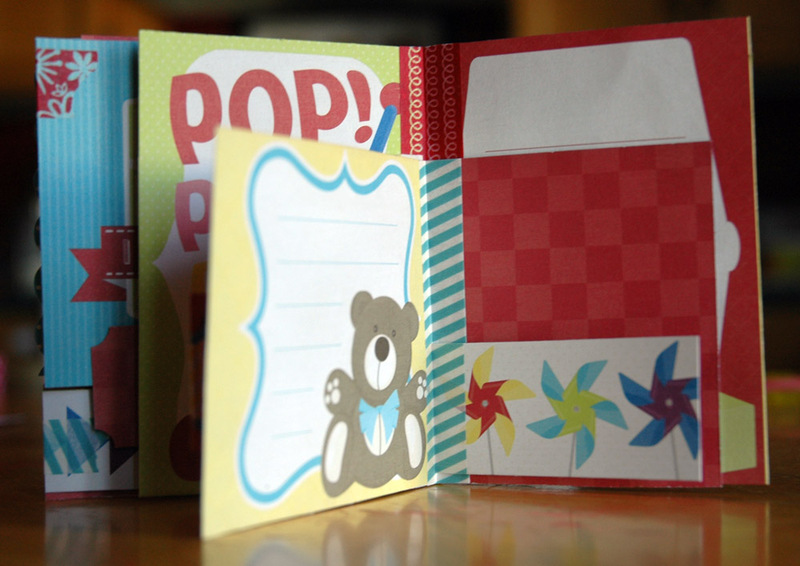 I’m planning to do a tutorial on how to make my one sheet, washi tape mini album next week. If there are any tutorials in particular you’d like to see, let me know! 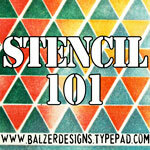 We’re at the end of the stencil techniques and today is my favourite way to use stencils – with modeling pastes! 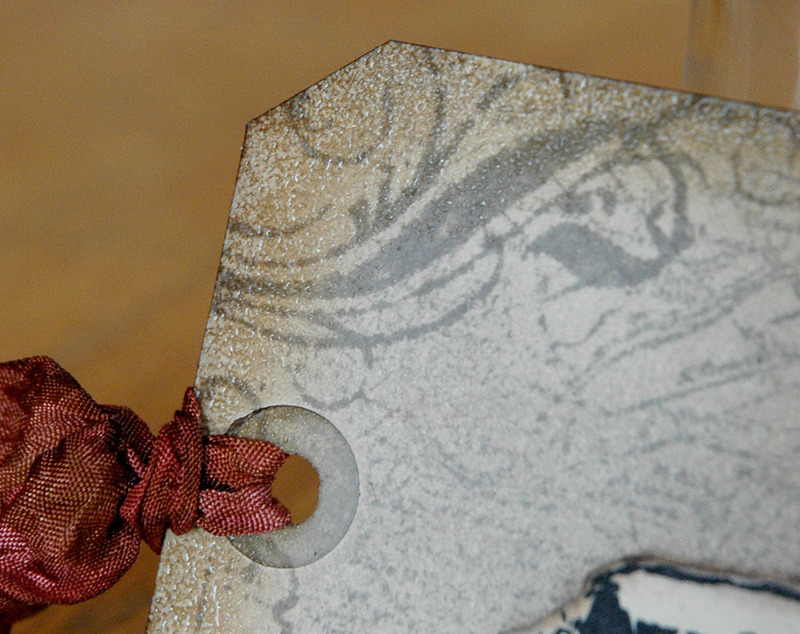 I love texture and dimension on my work, especially little pieces like tags. 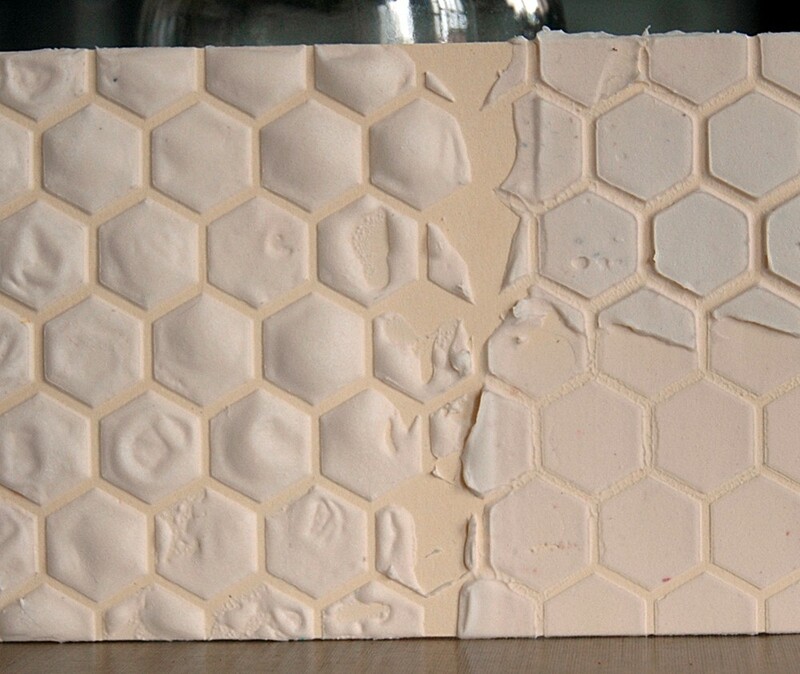 On a small surface, it’s hard to add lots of embellishments so extra texture adds interest without overwhelming the piece. 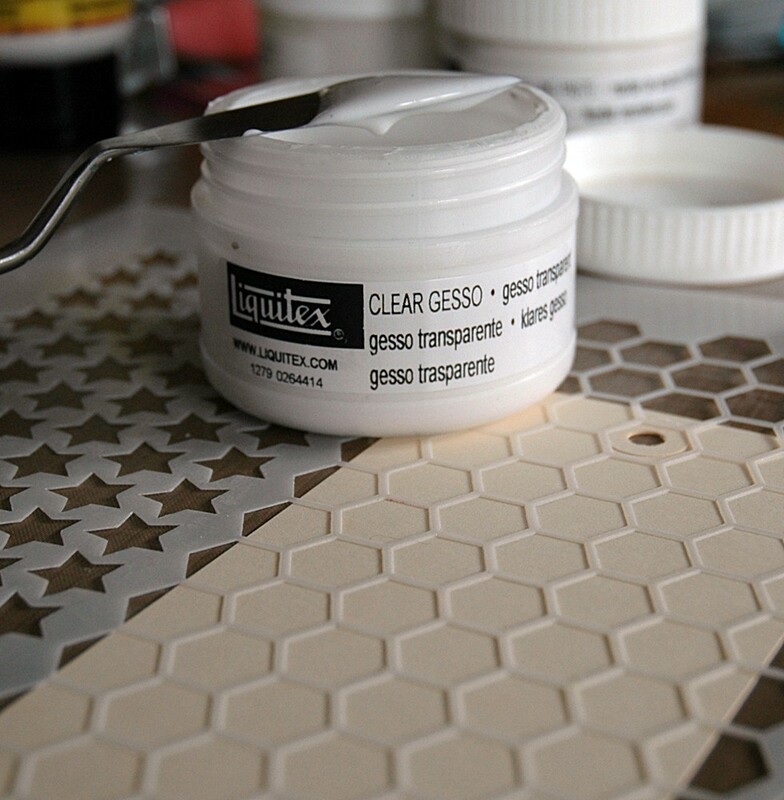 Today, I’m going to show you some of the pastes and gels I use and the difference between letting them air dry or heat drying them. 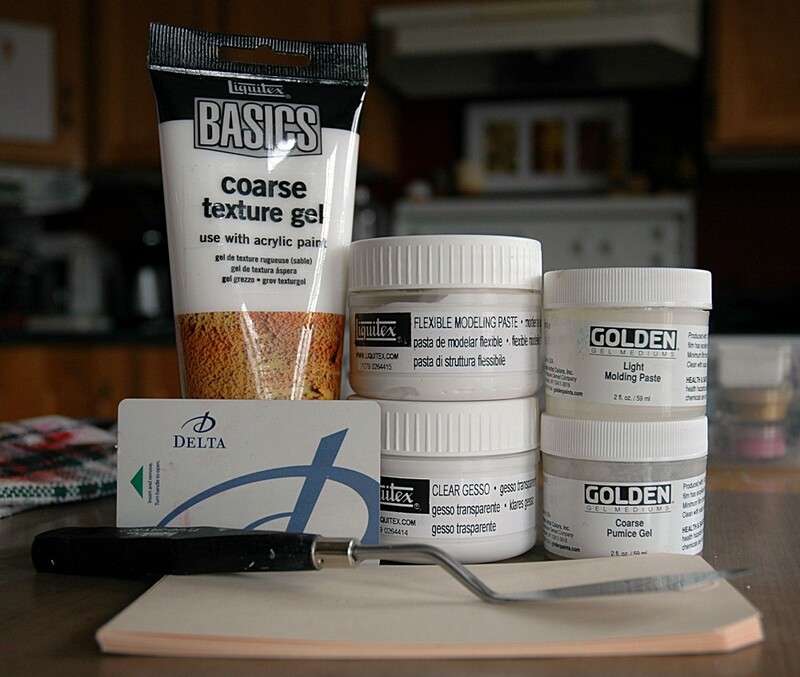 Either a stiff card (like an old bank card or hotel key), a palette knife, Light Molding Paste, Flexible Modeling Paste, Coarse Texture Gel, Coarse Pumice Gel, and Clear Gesso. 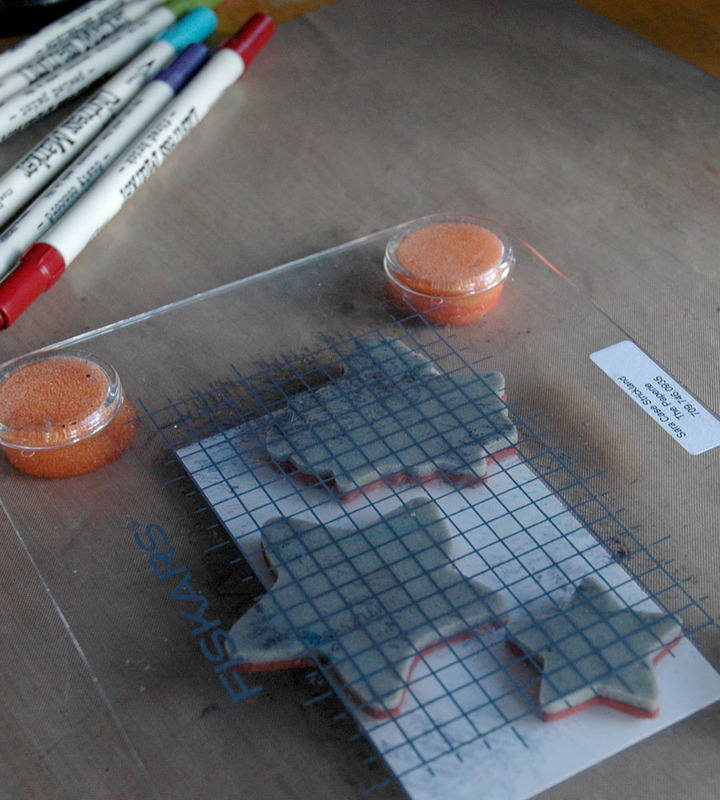 First take whichever medium you want to use and spread it over the stencil. 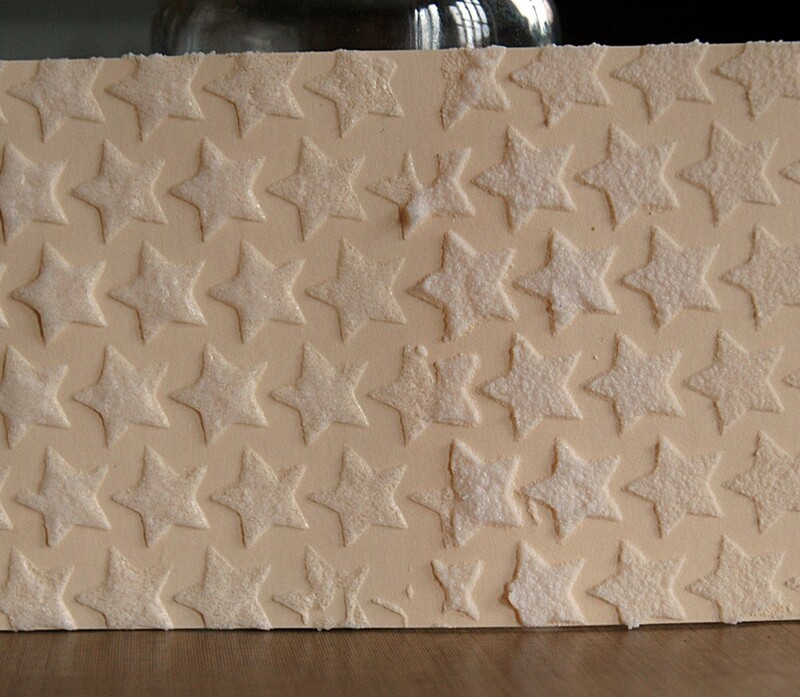 I like to go heavier in some areas and lighter in others for extra texture but it looks great all flat too. 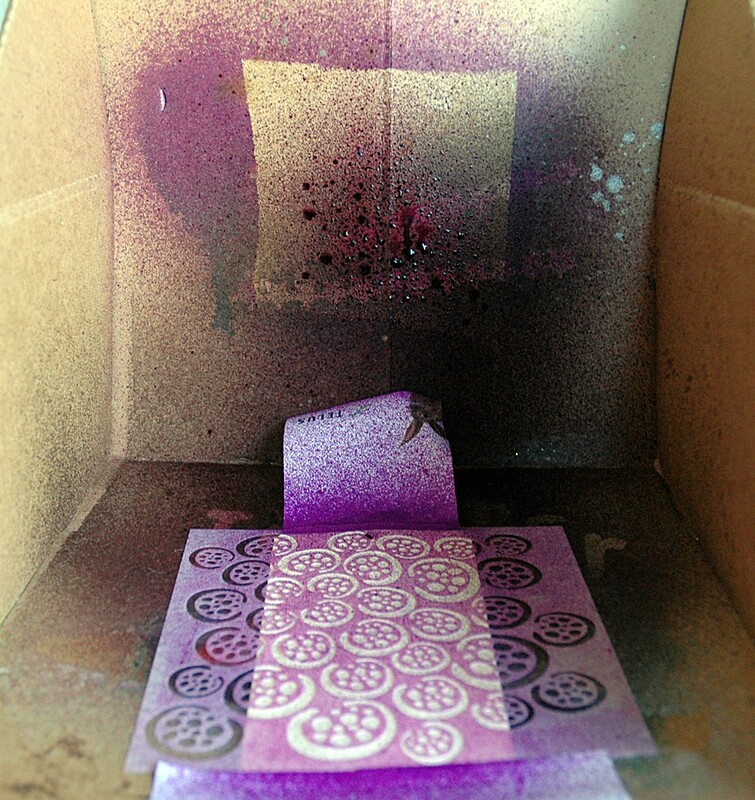 I found that the mist did soak into the air dried pastes more, whereas I noticed I could get more ink off the heat set side, almost like it was a resist. 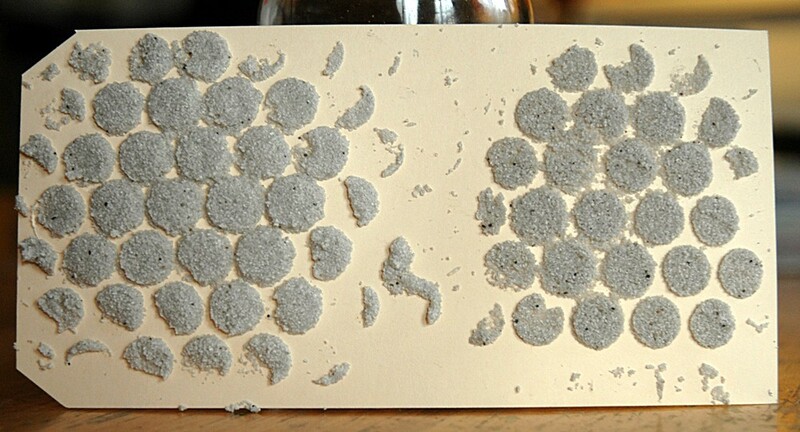 I didn’t do this with the Coarse Pumice Gel for two reasons: 1. It wasn’t dry, that stuff takes hours! and 2. I’ve tried it before and it always looks awful. 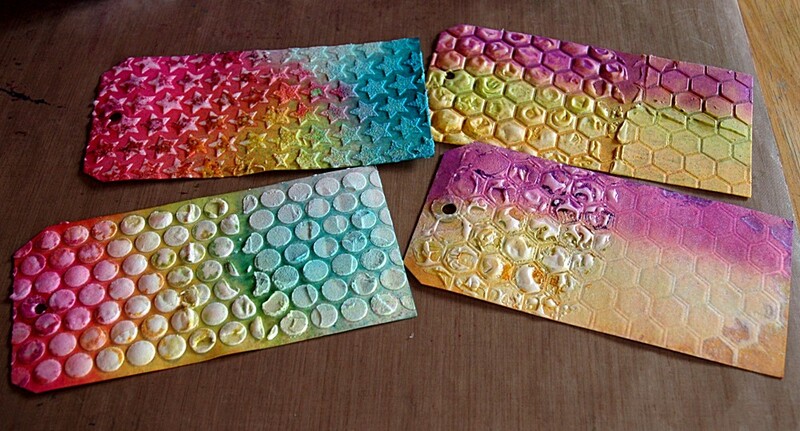 I have been told that mixing colour in first works well though. 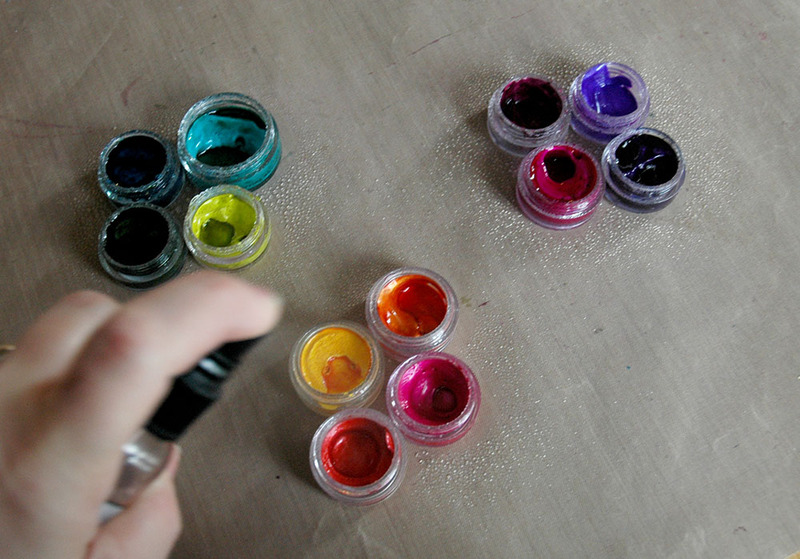 Speaking of mixing in colour, I’ve been trying to find a pigment to mix with pastes so they’re coloured without getting runny. 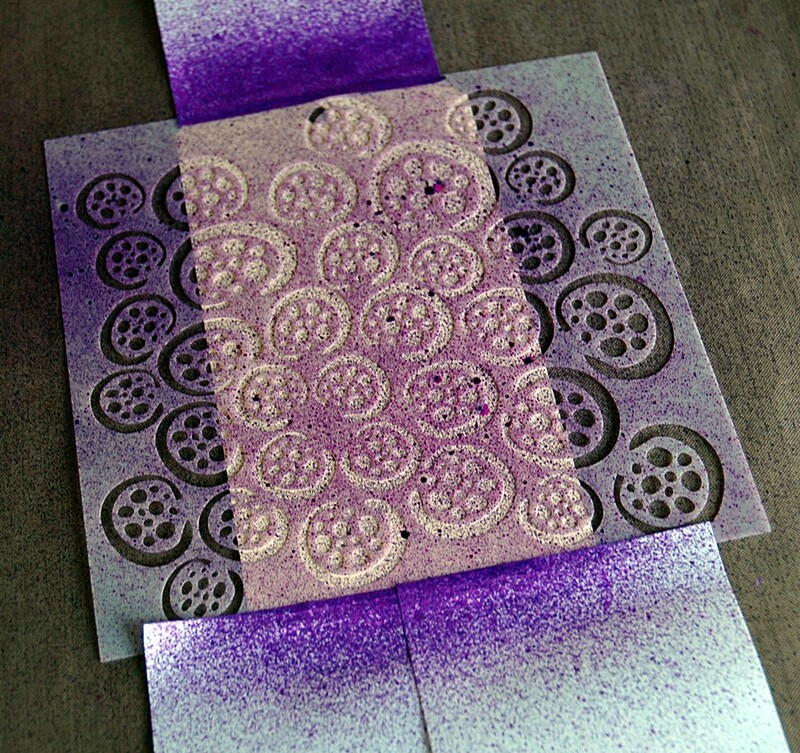 Remember, the drier the better for stencils and clean designs! The best colour I had found so far was Golden Heavy Body Fluid Acrylics, and it was just ok for me, maybe I need more colours to experiment with. 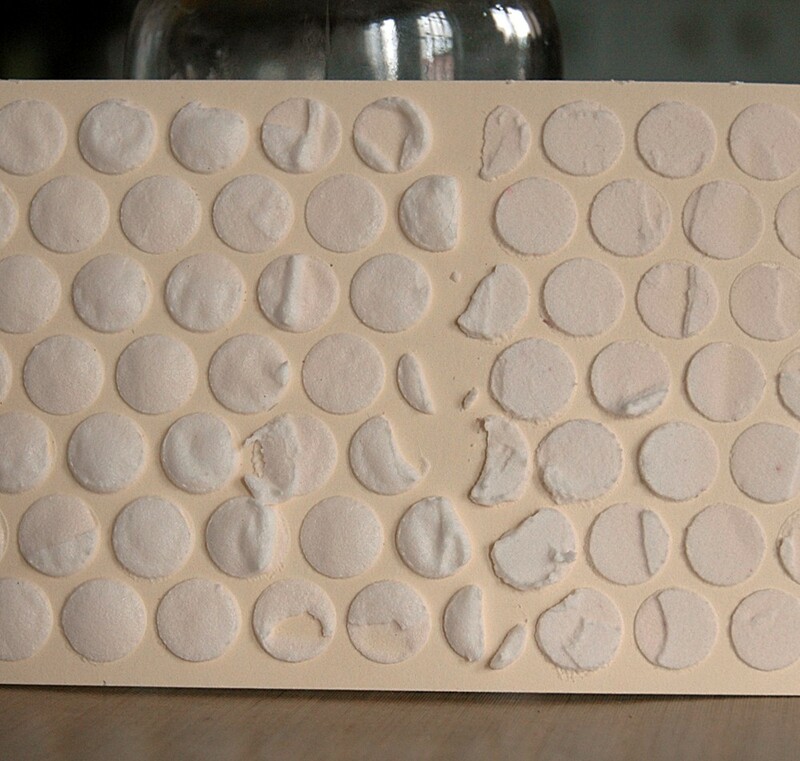 Today I tried my Perfect Pearls Powders – in a word, awesome! 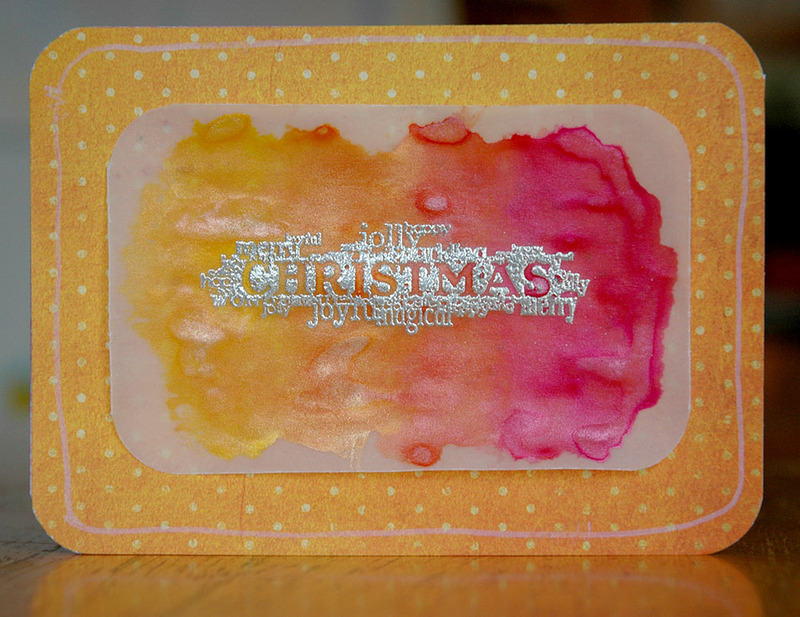 All you have to do with any pigment is take some paste out and plop it on your craft sheet, then add (or sprinkle!) 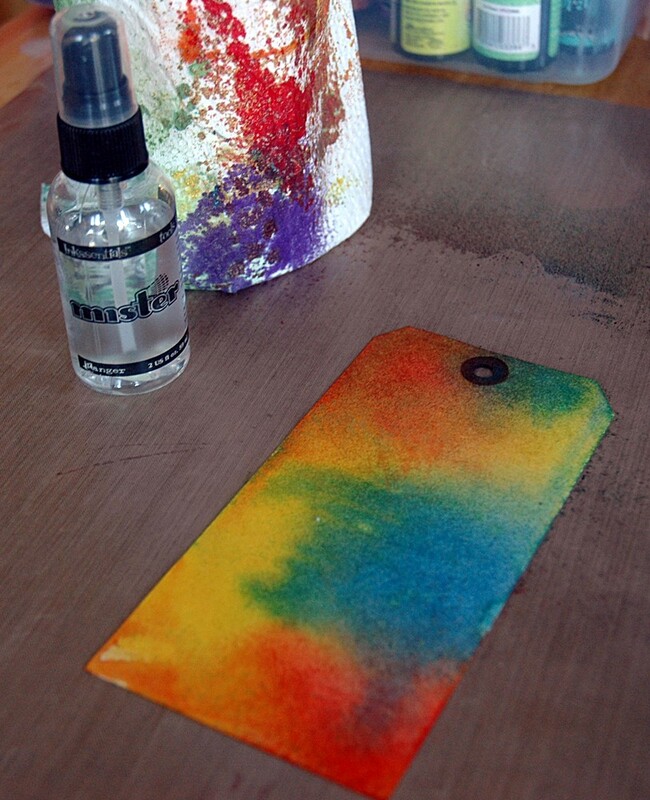 the pigment and use your palette knife or card to mix it up. 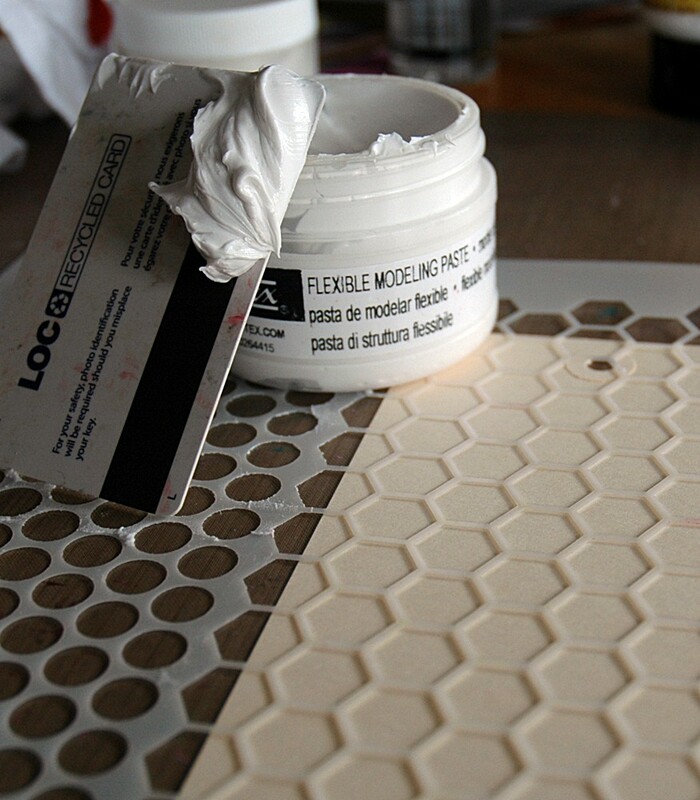 Then smear it over the stencil like usual. My only complaint about the Perfect Pearls? Once mixed in they’re not shimmery! 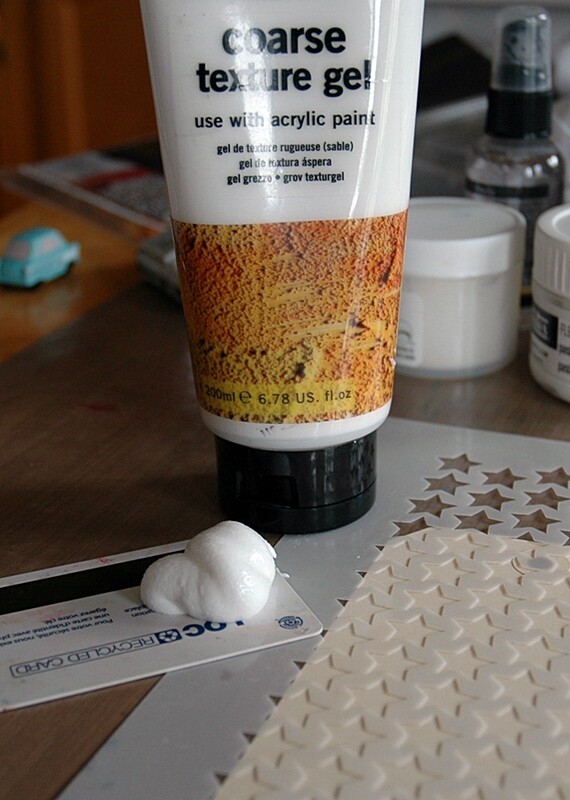 But the colours are great and because they’re a powder there’s nothing to liquify the paste. And see that quote? 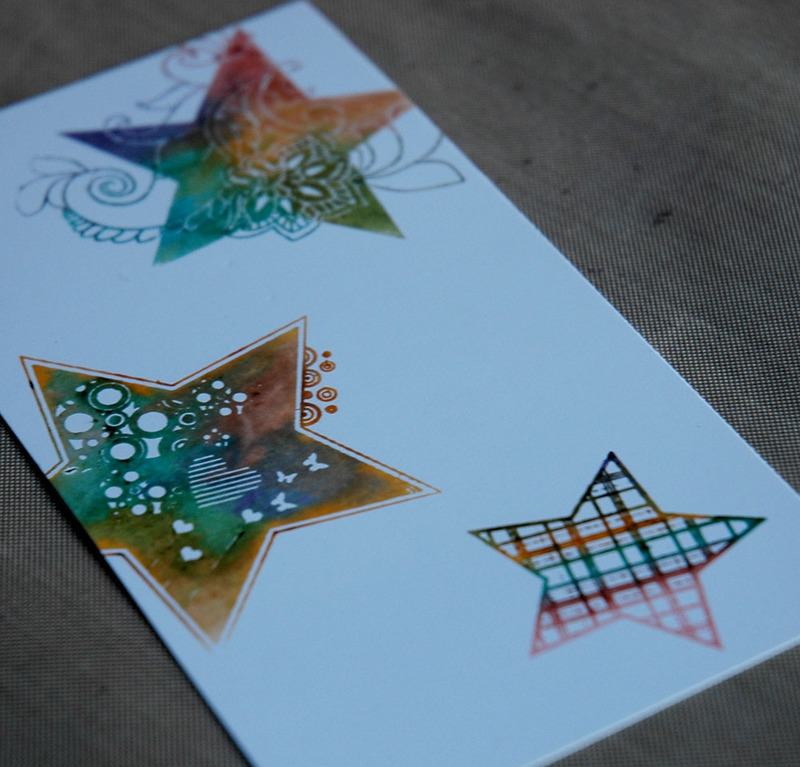 I had the card done, then found that on a sticker sheet – perfect! If you have any questions – let me know. 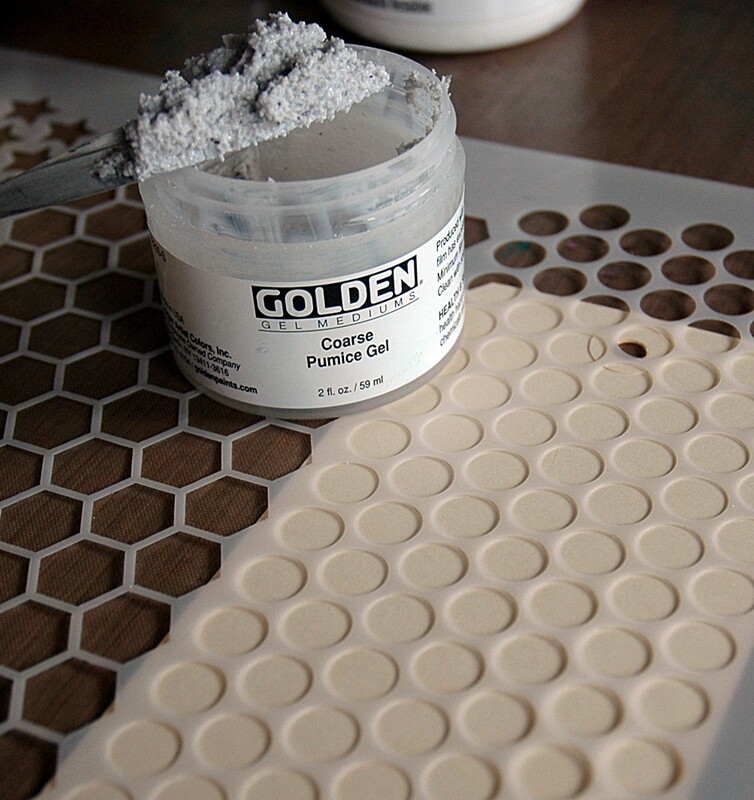 If you try out modeling paste in a project, link me up in the comments – you know I love to see them!